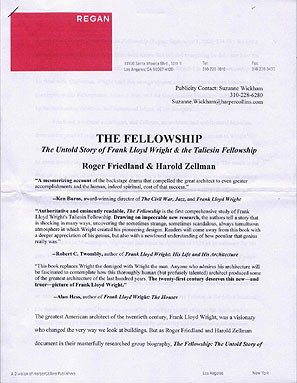 Title: The Taliesin Fellowship (Published by the Taliesin Fellowship, Spring Green, Wisconsin) Pages appear to be backed with rice paper. 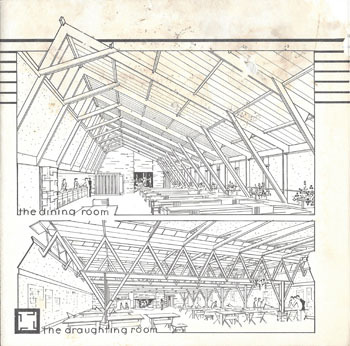 Left: Page 5 - The Dining Room (top), The Draughting Room (bottom). 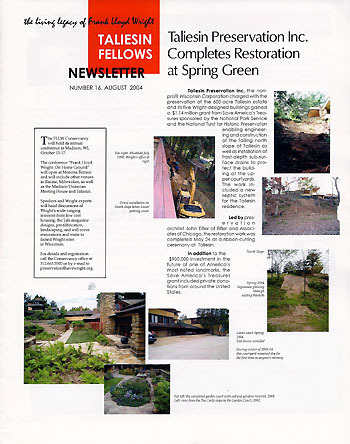 Right: Page 6 - Aerial view of the Taliesin Fellowship complex. 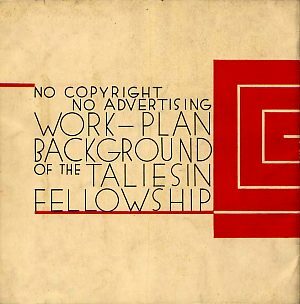 Left: Page 11 - The Taliesin Fellowship plot plan. 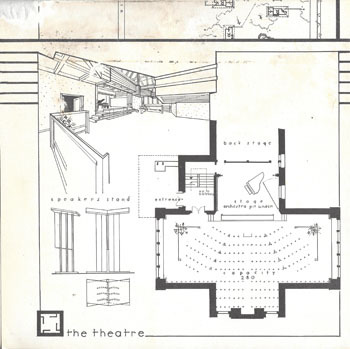 Right: Page 12 - The Theatre. Left: Page 15 - The Studios. Right: Page 16 - The Dining Room. The Taliesin Tea Room. 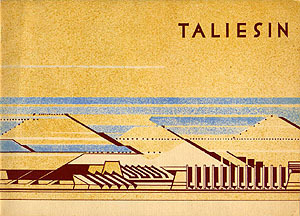 Description: Facsimile of 1933 Version by Taliesin Fellowship, Taliesin West. One difference is that this does not have the address flap for mailing. Includes mailing envelope. Description: Text of letter: "W.D. 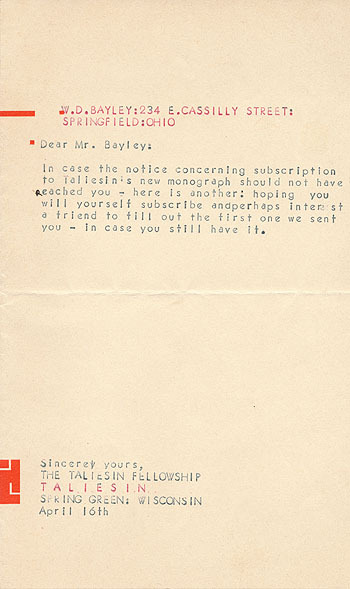 Bailey: 234 E. Cassilly Street: Springfield: Ohio (Typed in Red). 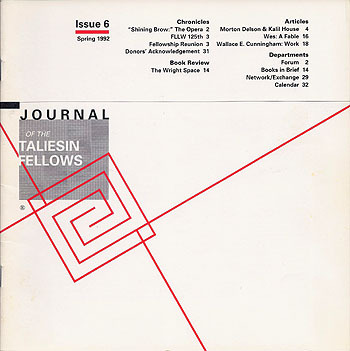 Dear Mr. Bailey: In case the notice concerning subscription to Taliesin's new monograph should not have reached you -- here is another: hoping you will yourself subscribe and perhaps interest a friend to fill out the first one we sent to you -- in case you still have it. Sincerely yours, the Taliesin Fellowship. Taliesin (Red). Spring Green: Wisconsin. April 16 (1934)." 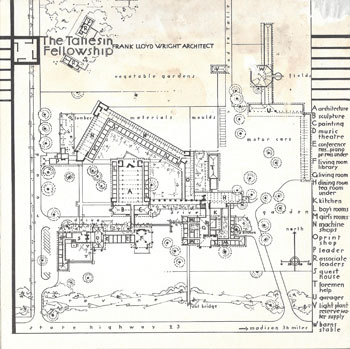 In 1932, Frank Lloyd Wright formed the Taliesin Fellowship with twenty-three apprentices who came to live, learn and work at Taliesin, in Spring Green. Bayley�s father, William Bayley, moved to Springfield in 1875 and was a prominent and influential figure in the civic and industrial development of this city. He was born in Baltimore, Maryland on July 28 1845. On February 21, 1871 he married Mary E. Dicus. They had four sons: William D., Guy D., Lee and Elden, and one daughter, Mary. He formed The William Bayley Co., a national designer, engineer and manufacturer of commercial windows with offices in Springfield, Chicago, New York and Washington. He also was a designer and engineer and held a number of patents. His eldest son, William Dicus Bayley, recipient of this letter, followed in his father�s footsteps, became president of his father�s company, and also held a number of patents, one with his father. 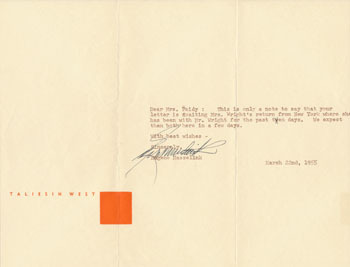 Although he never commissioned Wright to design a home, he must have been acquainted with Wright, hence this letter. He was also possibly familiar with the Burton Westcott Residence, Springfield, Ohio (1904 - S.099). Size: 10.5 x 8.4 folded to 5.25 x 8.4. Title: Announcement. 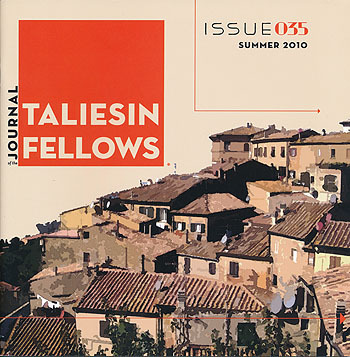 Taliesin Announces plans to publish the monograph "Taliesin" tri-weekly, seventeen times a year. 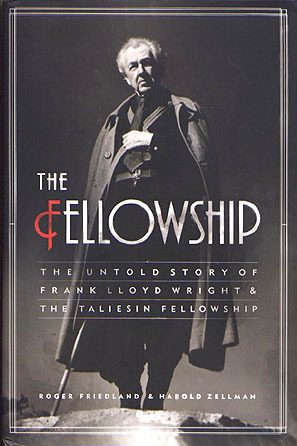 (Published by The Taliesin Fellowship. 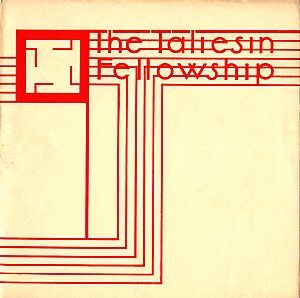 Printed on the same stock and ink (red and black) as the prospectus "The Taliesin Fellowship," 1933 (S#2036). 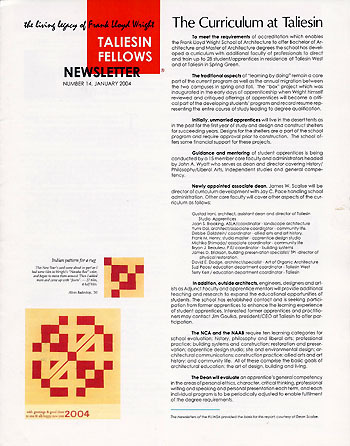 Description: Text of announcement included in letter to Bayley: "Taliesin is planning to issue a characteristic monogram in text and pictures portraying the work and ideals of the Taliesin Fellowship. The publication will be somewhat in the format of this prospectus, doubled in content and will be mailed tri-weekly to subscribers. Seventeen numbers will make the yearly volume. Subscription five dollars per year. The work will be edited to present a specific view of the working out of the principles enunciated in this perspective. Each number will contain detailed plans, abstract designs and models of the work executed in the nature of materials in accord with those principles together with current news of events in the life of the Fellowship. Editorial matter related to the various arts and to social economics will appear from time to time. The first number will issue May 15, 1934. 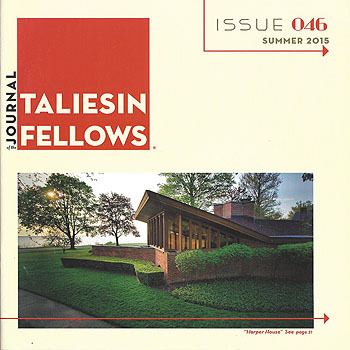 We hope that you are sufficiently interested in our work to become a subscriber to TALIESIN. 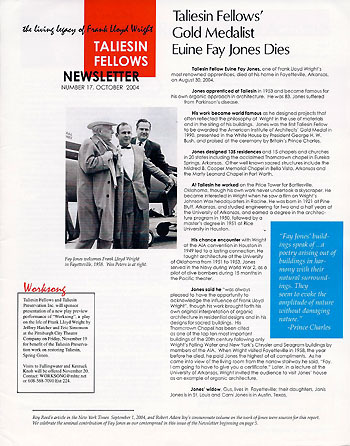 By mailing a check for five dollars payable to Frank Lloyd Wright you will receive the magazine in due course. The monograph TALIESIN will carry no advertising material." 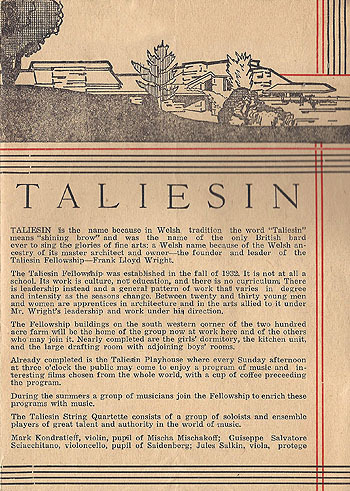 The Taliesin Fellowships first prospectus was dated January 1, 1933 and printed in black ink on white stock (S#2035). 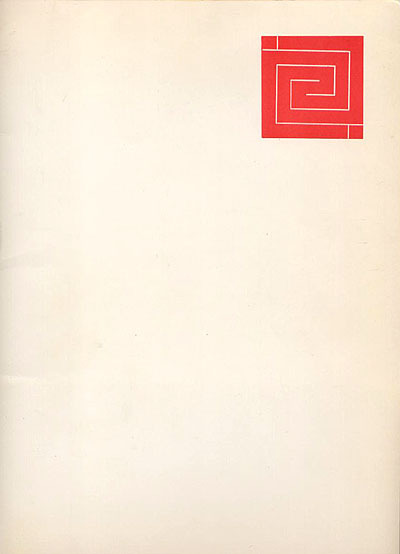 The second prospectus was dated December, 1933 and printed in red and black ink on beige stock (S#2036). Taliesin I, No. 1 (S#2037) was not dated but published in 1934. The cover read in part "Nine Times a Year." Unfortunately, it was not published seventeen or nine times a year. 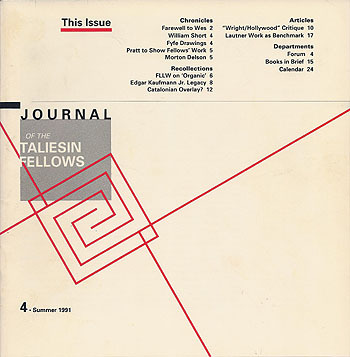 The next issue of Taliesin was published in October 1940, again as Taliesin 1, No. 1 (S#2040). Two copies. Description: Text of notice included in letter to Bayley: "Due to an unfortunate delay in printing, this announcement was not enclosed in the prospectus sent to you. 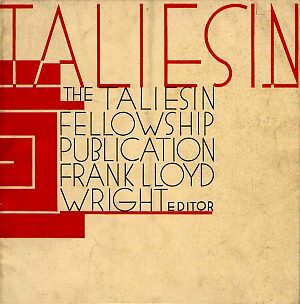 Would you kindly send to us the names of any friends of yours who you think might be interested in subscribing to the monograph TALIESIN. We will be glad to send the prospectus to them with subscription blank enclosed. 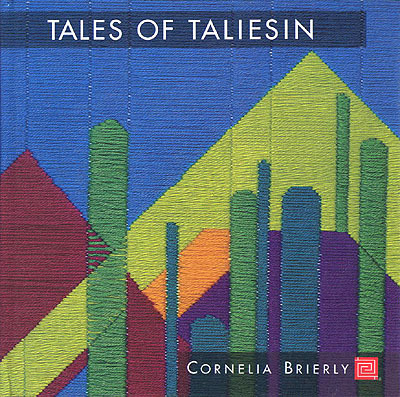 Title: Taliesin, Volume 1, No 1. "Taliesin. Nine Times a Year. 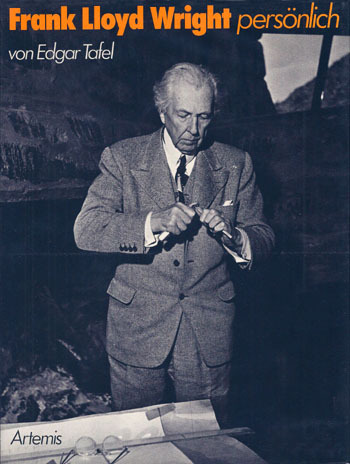 Frank Lloyd Wright, Editor. The Taliesin Fellowship Sole Contributor and Factor. No Copyright ----Advertising." Author: Wright, Frank Lloyd; de Fries, Heinrich; Papadaki, Stamo; Schubart, Pauline; Liang, Yen; Field, Dorothy Johnson; Tafel, Edgar A. 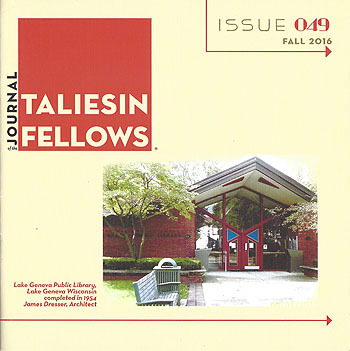 Title: Taliesin, Vol. 1 No 2, February 1941. 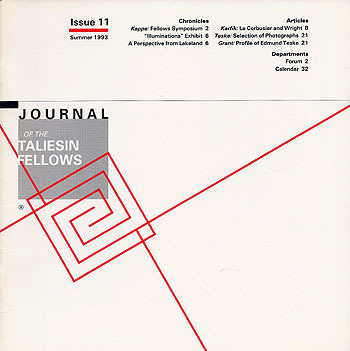 "Taliesin, The Taliesin Fellowship Publication. 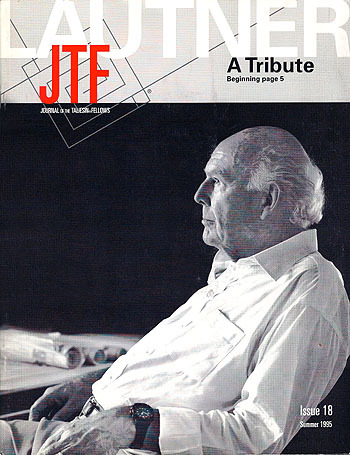 Frank Lloyd Wright Editor." 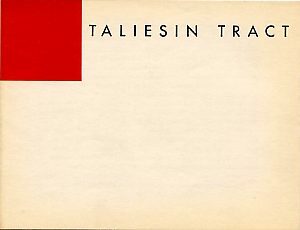 Title: Taliesin Spring Green Letterhead Circa 1942-43. 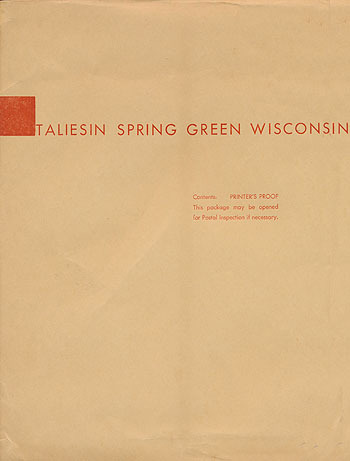 Description: Stylized red square with vertical text: "Taliesin - Spring Green Wisconsin." Watermark: "Permanized Redemption Bond Rag Content." See Building The Pauson House, Green, 2011, p.34, 36, 48-49, 54, 68, 72-73, 77, 79, 1939-1941 for letterheads similar to this style. Similar to sample dated June 18, 1939, see Building The Pauson House, Green, 2011, p.21, 22, 24, 27, 31. 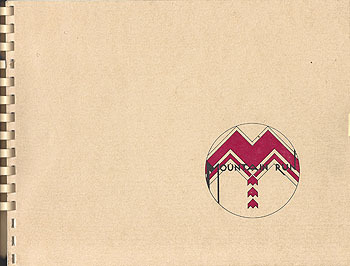 Similar to Taliesin West letterhead dated April 16, 1942 (below). Also similar to letter dated January 2nd, 1943, with a solid red square. Both additional samples include the watermark: "Permanized Redemption Bond Rag Content." Acquired from the estate of David Henken. David Henken was a Taliesin apprentice from 1942 and 1943. David and his wife Priscilla Henken arrived at Taliesin on October 1, 1942, and according to Taliesin Diary, A Year With Frank Lloyd Wright, Henkin, 2012, stayed there one year. Possibly acquired when Henken was an apprentice at Taliesin from 1942-43. Size: Horizontal letterhead 11 x 8.5. 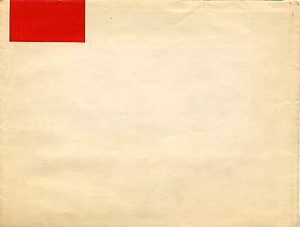 Letterhead dated April 16, 1942. 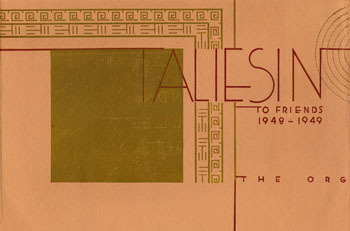 Title: Taliesin Spring Green Envelope Circa 1942-43. 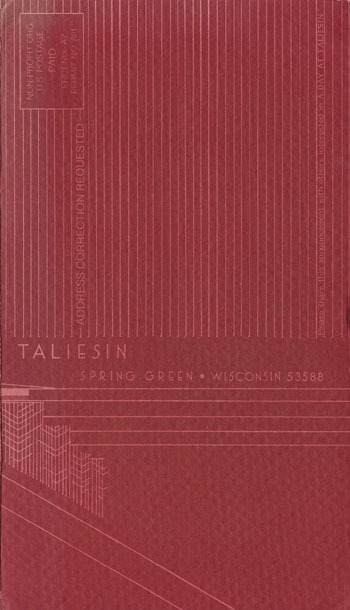 Description: Vertical Envelope with partial solid red square and text: "Taliesin Spring Green Wisconsin. Contents: Printer�s Proof. This package may be opened for Postal Inspection if necessary." Acquired from the estate of David Henken. David Henken was a Taliesin apprentice from 1942 and 1943. David and his wife Priscilla Henken arrived at Taliesin on October 1, 1942, and according to Taliesin Diary, A Year With Frank Lloyd Wright, Henkin, 2012, stayed there one year. Possibly acquired when Henken was an apprentice at Taliesin from 1942-43. Size: Vertical Envelope 9 x 12. 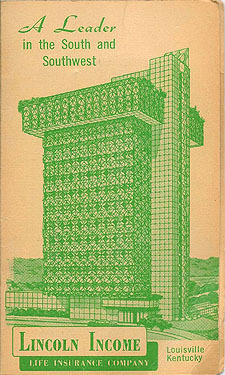 Title: Price Tower Model (1952 - S.355), Circa 1952. 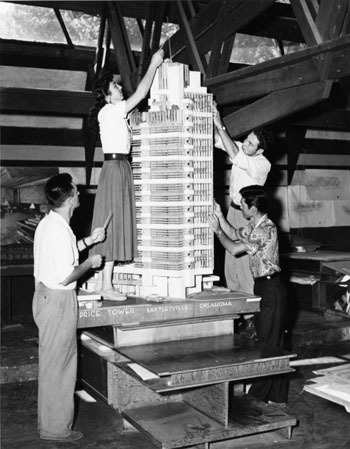 Description: Four apprentices putting the finishing touches on the model of the "Price Tower, Bartlesville, Oklahoma." They are working in the drafting Room at Taliesin, Spring Green, Wisconsin. 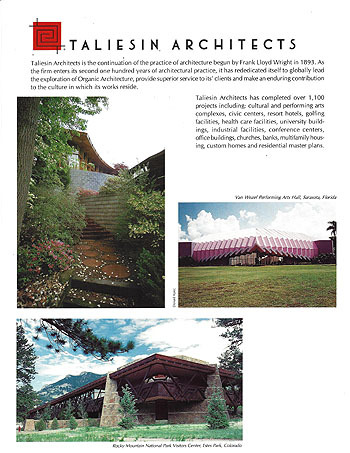 Published in "Frank Lloyd Wright�s Taliesin Fellowship," Marty; Marty, 1999, p.83. Size: 7.75 x 10 B&W photograph. 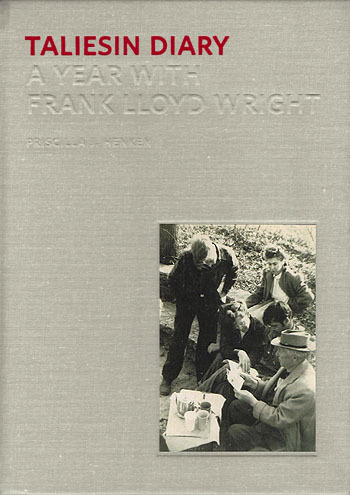 Title: Wright and apprentices, 1955. 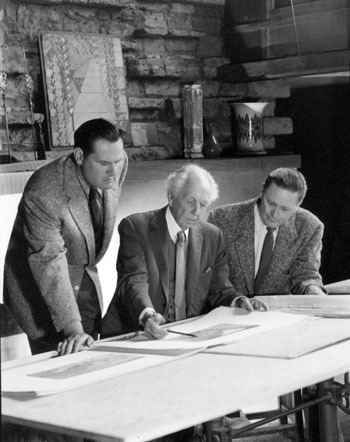 Description: William Wesley Peters (left), Frank Lloyd Wright and Gene Masselink (right) at the Hillside Drafting Room, Taliesin Spring Green. Photographed by John Engstead for the November 1955 issue of House Beautiful, page 242. Possibly photographed on Wright's 88th birthday. 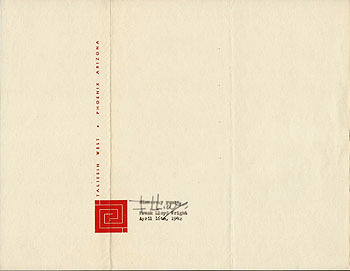 Title: Letter From Eugene Masselink, Taliesin West. Description: Signed typed letter on Taliesin West stationary from Eugene Masselink to Diana Faidy wife of Chicago Art Deco architect Abel Faidy. "Dear Mrs. Faidy : This is only a note to say that your letter is awaiting Mrs. Wright's return from New York where she has been with Mr. Wright for the past 10 days. We expect them both here in a few days. 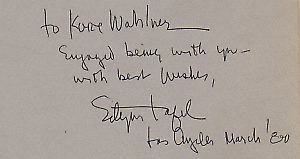 With best wishes - Sincerely, Eugene Masselink (Sighed), Eugene Masselink. March 22nd, 1955." From August 1954 through January 1959, Frank Lloyd Wright lived and remodeled a suite at the Plaza Hotel in New York City on the South end of Central Park, where he coordinated the completion of one of his greatest works, The Guggenheim Museum. Eugene Masselink (1910-1962) was born in South Africa but his family moved to Grand Rapids, Michigan. 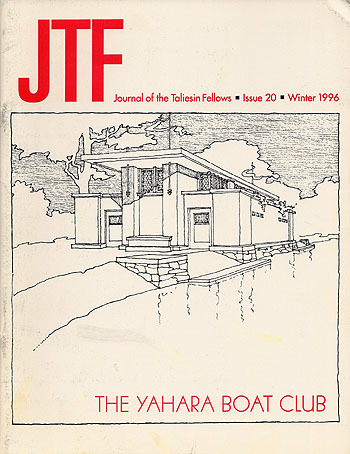 Masselink came to the Taliesin Fellowship in Spring Green, Wisconsin in 1933 as a charter member, and never left. He passed away in 1962 after suffering a heart attach. 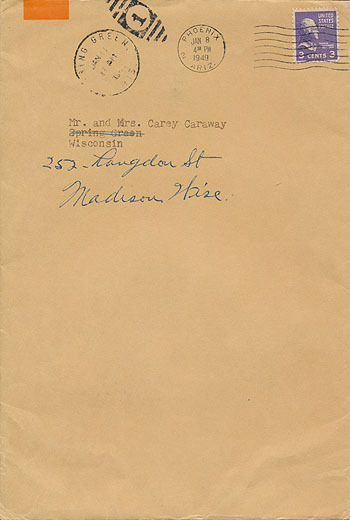 Envelope addressed to Mrs. Diane Hurbert Faidy. Size: Single sheet, twice folded, 8.5" by 11". Envelope: 9.5 x 4.2. 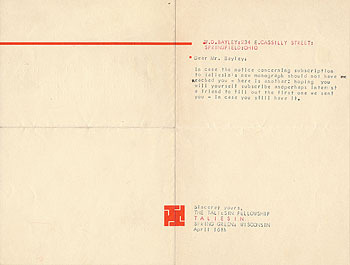 Title: Invitation from Olgivanna Lloyd Wright to Mrs. Fritz, 1960. Description: "April 30, 1960. 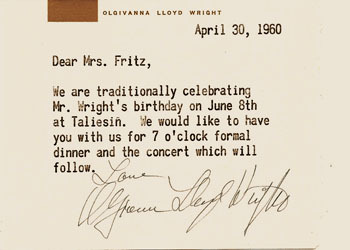 Dear Mr. Fritz, We are traditionally celebrating Mr. Wright�s birthday on June 8th at Taliesin. We would like to have you with us for 7 o�clock formal dinner and the concert which will follow. 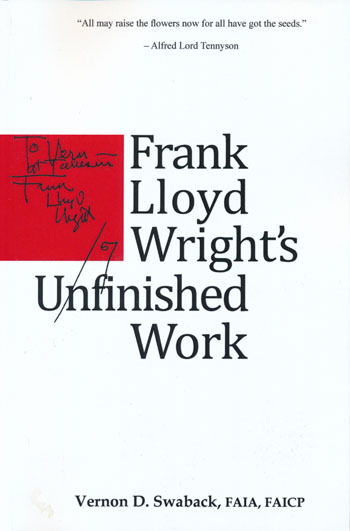 (Signed) Love Olgivanna Lloyd Wright." Herbert Fritz Sr. was one of the early draftsman who worked with Frank Lloyd Wright in 1913 in Spring Green, and was one of two that survived the fire at Taliesin in 1914, killing seven including Mamah Cheney and her two children. Herb married Mary Olava Larson, Wright�s stonemason�s daughter. Their son was Herb Fritz Jr. (1915-1998), also an apprentice with Wright in from 1937-1941, and their daughter, Frances Fritz who married another Taliesin Fellow, Jesse Claude (Cary) Caraway. Herbert Jr. Married Eloise, their daughter Barbara married another Taliesin fellow, Jim Dresser. Size: Single sheet folded to 5.5 x 4.25. 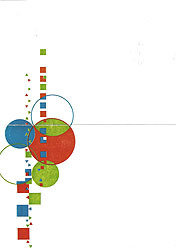 Title: Abstract Design by Eugene Masselink of The Frank Lloyd Wright Foundation. 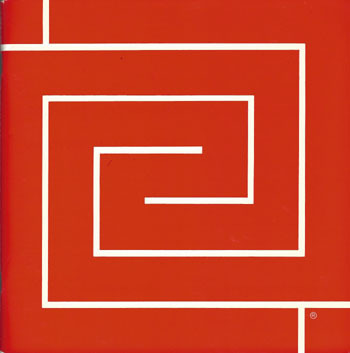 Description: "Abstract Design by Eugene Masselink of The Frank Lloyd Wright Foundation. The Stanford Art Gallery - April 1960. The major portion of this exhibition consists of preliminary drawings and photographs of architectural murals. As the composer has his systematic staff and intervals and the architect a modular system as the framework of design, just so has the designer the same means to coordinate abstract ornamentation with the architectural principles involved. Thus the square, the triangle, the circles as well as the straight line become a fundamental part of the design vocabulary." Two copies. Title: The Department of Art and Architecture of Stanford University cordially invites you to attend a preview. Description: "The Department of Art and Architecture of Stanford University cordially invites you to attend a preview, Abstracts for Architecture, By Eugene Masselink of The Frank Lloyd Wright Foundation. A reception honoring Mr. Masselink will be held at the Stanford Art Gallery, Five to Seven P.M., April 6." 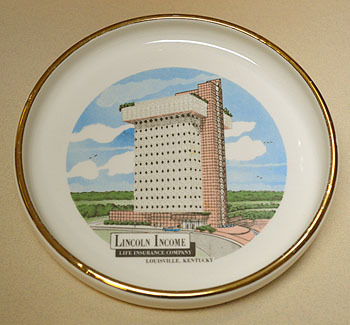 Title: Lincoln Income Life Insurance Company, Louisville, Kentucky, Large ceramic Ashtray Circa 1970s. Description: Completed in1966, the fifteen story office building was built under the leadership of Lincoln Income president John T. Acree, Jr. Designed by William Wesley Peters and the Taliesin Associated Architects. Peters married Wright's adopted daughter Svetlana in 1935, but lost her and a son eleven years later in a car crash. He became the head of Wright's architectural firm Taliesin Associates after Wright's death in 1959. 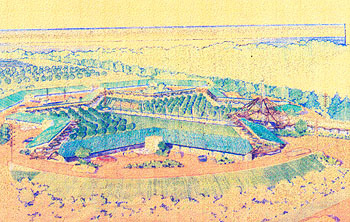 Peters based the design of the Louisville complex on a unbuilt design Wright created in 1945 for the Sarabhai Calico Mills Store, Ahmadabad, India. In 1986, following Lincoln Income's acquisition by Conceco Insurance of Indianapolis, Kaden Companies Partnership acquired the building and changed its name to the Kaden Tower. Manufactured by Morgan Plastics, Nashville, Tennessee. 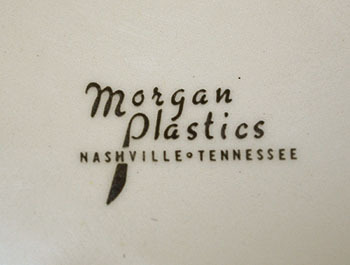 Morgan Plastics began in 1946 and later became Morgan Enterprises. Illustration in four colors plus gold rim. Size: Ceramic Ashtray 8.75 round x 1" deep. 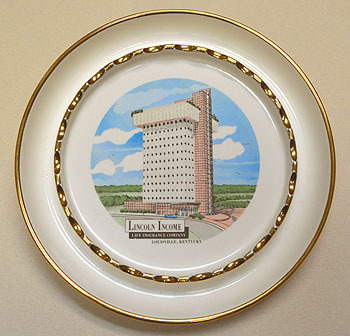 Title: Lincoln Income Life Insurance Company, Louisville, Kentucky, Ceramic Dish Circa 1970s. Size: Ceramic Dish, 6.9" round x 7/8" deep. 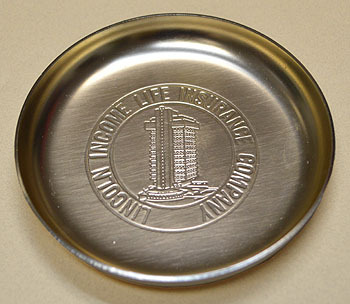 Title: Lincoln Income Life Insurance Company, Round metal dish Circa 1970s. Description: Completed in1966, the fifteen story office building was designed by William Wesley Peters and the Taliesin Associated Architects. Peters married Wright's adopted daughter Svetlana in 1935, but lost her and a son eleven years later in a car crash. He became the head of Wright's architectural firm Taliesin Associates after Wright's death in 1959. 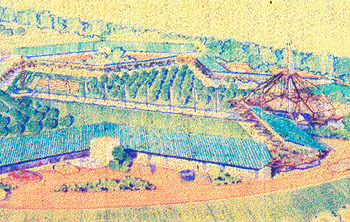 Peters based the design of the Louisville complex on a unbuilt design Wright created in 1945 for the Sarabhai Calico Mills Store, Ahmadabad, India. 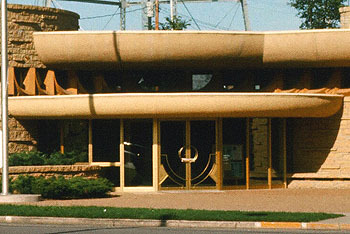 In 1986, following Lincoln Income's acquisition by Conceco Insurance of Indianapolis, Kaden Companies Partnership acquired the building and changed its name to the Kaden Tower. Size: Metal dish 4.4 round x .5" deep. Courtesy of Royal Photo Co. (circa 1965). Courtesy of the Frank Lloyd Wright Foundation. 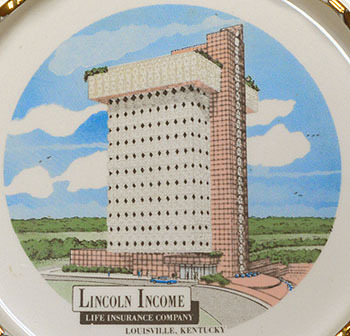 Title: Lincoln Income Life Insurance Co., Louisville, Kentucky (Completed in 1966). Description: A fifteen story office building, at a cost $2.7 million, it was built under the leadership of Lincoln Income president John T. Acree, Jr. Designed by the Taliesin Associated Architects, William Wesley Peters. Peters married Wright's adopted daughter Svetlana in 1935, but lost her and a son eleven years later in a car crash. He became the head of Wright's architectural firm Taliesin Associates after Wright's death in 1959. Peters based the design of the Louisville complex on a unbuilt design Wright created in 1945 for the Sarabhai Calico Mills Store, Ahmadabad, India. In 1986, following Lincoln Income's acquisition by Conceco Insurance of Indianapolis, Kaden Companies Partnership acquired the building and changed its name to the Kaden Tower. Complimentary Needle Pack. "A Leader in the South and Southwest. 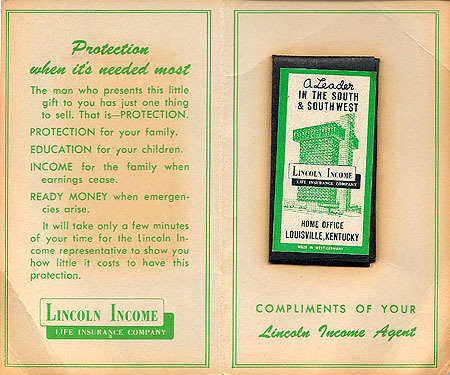 Lincoln Income Life Insurance Company, Louisville, Kentucky." Contains two sewing needles. Size: 2.25 x 3.75 opens to 4.5 x 3.75. Size: 9 x 6.25, opens to 20.25 x 6.25. 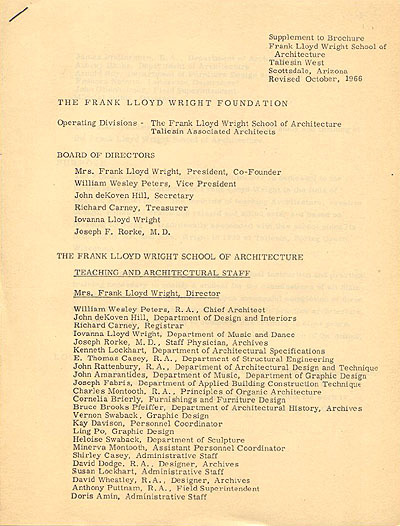 Description: Portfolio of work by the Frank Lloyd Wright Foundation. Annunciation Greek Church (1961), Arizona Baltimore Restoration (1973), Arizona Baltimore Estates Master Plan (1973), Ascension Lutheran Church (1964), Ball Office Complex (1972-75), Bank of Spring Green (1972), Bartell Motel (1963), Belmont Pavilion & Grandstand (1964), Beth Sholom Synagogue (1959), Bush Community Services Building (1971), Center College Fine Arts center (1973), San Jose Community Theater (1972), Corbin Education Center (1964), Court of the Seven Seas (1962), Damavand College (1972), Delano Mortuary (1966), Dodge Fountain (1971), East Papago Indian Bend Freeway (1968-70), First Christian church (1973), Grady Gammage Memorial Auditorium (1964), Guggenheim Museum Annex (1968), Hopi Post Office (1976), Island of Mindo, Kalita Humphreys Theater (1959, 1969), Keystone Towers (1962), Kentuckiana Medical Center (1962), Kona Coast Hotel, Lewis and Rloca Offices (1972), Liberty National Bank (1966), Lincoln Income Life Insurance Building (1966), Lukeville Border Station (1976), Madison Civic Auditorium (1969), Marin County Center Master Plan (1970-71), Marin County Administration Building (1962), Marin Civic Center Veterans Memorial Auditorium (1971), Marin Civic Center Post Office (1962), Marin County Hall of Justice (1970), Mesa Civic Center (1974), Mikro Kodesh Synagogue (1969), Monona Basin Project (1967), Mountain Run Ski Resort (1971), Arizona State University Music Center (1971), Our Lady of Fatima (1976), Park Fletcher Industrial Park (1965), Pearl Palace (1973), Phoenix Center for the Performing arts (1965), Pilgrim Congregational Church (1963), Prairie School (1965), Resort Community (1973), Rocky Mountain National Park Administration Building (1966), S.C. Johnson & Son Administration Building Alterations (1961 - 76), Schubach Jewelers (1973), S.C. Johnson Golden Rondelle (1967), St. Mary�s Church (1970), Spring Green Restaurant (1967), Truax Community Center (1969), Unitarian Church Addition (1963), Upper South Platte Environmental Study (1973), Van Wezel Center for the Performing Arts (1970), Villa Mehrafarin (1976), Wintergreen Ski Lodge (1968). Each page includes information about the project and a photograph or illustration. Printed single sided only. Spiral bound and plain slip box. 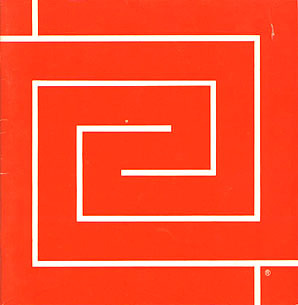 Title: Edgar A. Tafel 1973. 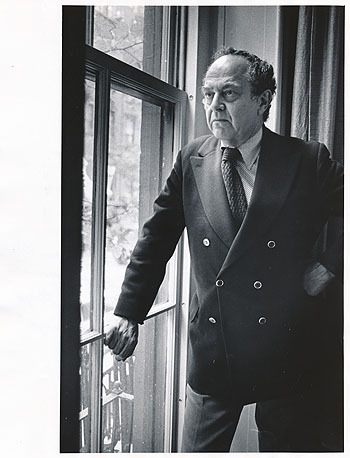 Description: Edgar Tafel, wearing a double breasted suit and tie, gazing out his window. His right hand is resting against the window, his left hand is resting on his hip. He was born on March 12, 1912, and past away January 18, 2011. 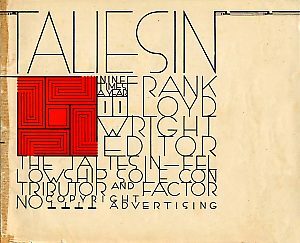 "Edgar Tafel, architect, studied under Frank Lloyd Wright from 1932 to 1941 at both Taliesin in Taliesin West. As a senior apprentice he worked with Wright on all phases of the design and construction of such major projects as Fallingwater, the Johnson Wax Building, and the Johnson home. Wingspread. 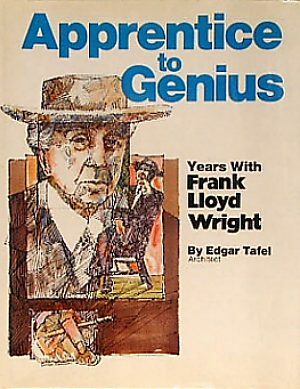 All through his practicing years Tafel had been involved with Wright buildings and with their preservation..." From Apprentice to Genius, back cover. Hand written on verso: "(Edgar Tafel,) N. Y. Architect, formerly of Spring Green, Wis. - student & associate of Frank Lloyd Wright. 1973 pic." Stamped on verso: "Richard Bauer." "Jan 11 1977." Photographed by Richard Bauer. Description: From the special vantage point of a former apprentice who for nine years lived and worked under "the fury and wrath of genius," Edgar Tafel presents a wonderfully revealing portrait of America�s greatest architect. Unpredictable, cantankerous, a striking figure with white hair, cape and cane, Frank Lloyd Wright was an individualistic spirit who delighted in acting out his own myth. Here is an intimate view of the many moods of Wright the man, warts and all, the inspired teacher, and the creative visionary, by a devoted student who came to know him as few others have. 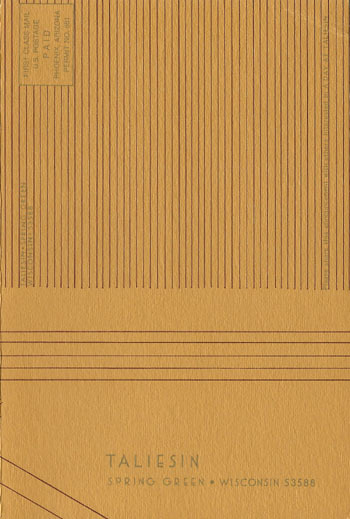 (Back cover.) Original HC List Price $19.95. (First Edition) Two copies, one signed. Description: 1985 Printing. From the special vantage point of a former apprentice who for nine years lived and worked under "the fury and wrath of genius," Edgar Tafel presents a wonderfully revealing portrait of America�s greatest architect. Unpredictable, cantankerous, a striking figure with white hair, cape and cane, Frank Lloyd Wright was an individualistic spirit who delighted in acting out his own myth. Here is an intimate view of the many moods of Wright the man, warts and all, the inspired teacher, and the creative visionary, by a devoted student who came to know him as few others have. (Back cover.) Original SC List Price $9.95. (Second Edition) Two copies, both signed. Description: Reproduction of a holiday card sent by Mrs. Frank Lloyd Wright and the Taliesin Fellowship, 1981. Design by Fellowship member Margaret Allen Montooth. 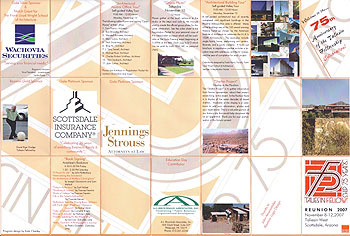 Design covers front and back (7 x 10, folds to 7 x 5). Inside: "Be Healthy. Be Happy. Have a Long Life! 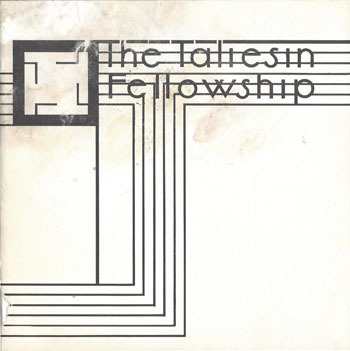 The Taliesin Fellowship." Acquired from the estate of Cary Caraway. Description: The main theme of the day will be Broadacre City. Included will be Lectures, Discussion and Activities. Broadacre: The Idea; The elements and present applications; The integration of planning & architecture; Original Frank Lloyd Wright drawings & Model. Mrs. Frank Lloyd Wright and members of the Taliesin Fellowship, the staff and students invite you to a day at Taliesin, Spring Green, Wisconsin." Size: 16 x 8.25 folded to 5.5 x 8.25. Description: Informational brochure that describes the different facets of the foundation. Sections include: Frank Lloyd Wright Foundation; Taliesin; Taliesin West; Taliesin Associated Architects; Frank Lloyd Wright Archives; Taliesin Council; Frank Lloyd Wright School of Architecture; Friends of Taliesin; Seminars; Tours. 1985. Gift from Kathryn Smith. 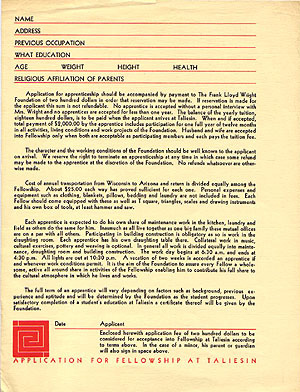 Description: Brochure for the Frank Lloyd Wright School of Architecture Scholarship includes two sections. 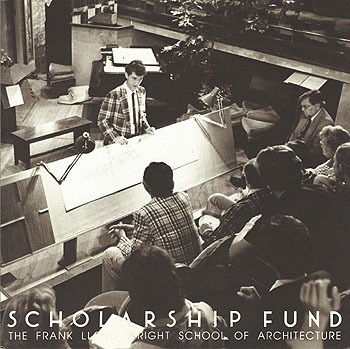 The Philosophy of the Frank Lloyd Wright School of Architecture, and information on the Scholarship Fund. Includes three photographs. Gift from Kathryn Smith. 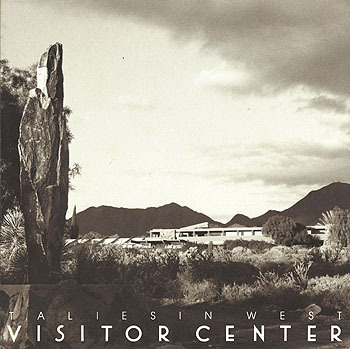 Description: Brochure for the proposed Visitor Center at Taliesin West includes two sections. The proposed Visitor Center and The Commitment. Includes one photograph and two illustrations. Gift from Kathryn Smith. Description: Heritage of Organic Architecture for Tomorrow. Lectures, Discussion and Activities. The Force of Change; A Future Agenda; The Organic Architect�s Role; Exhibition of the Drawings of Frank Lloyd Wright; Frank Lloyd Wright Achieves..."
Size: 14 x 8.5 folded to 4.75 x 8.5. Description: Your Hosts and Hostesses. 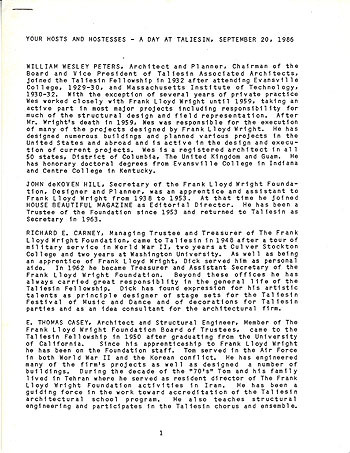 A biographical list of the Hosts and Hostesses for A Day At Taliesin, September 20, 1986. Some include; William Wesley Peters; John deKoven Hill; Richard Carney; Thomas Casey; Cornelia Brierly; Kay Rattenbury; Kenneth Lockhart; Frances Nemtin; Charles Montoopth; Ling Po; Bruce Brooks Pfeiffer; Heloise Crista; John Rattenbury; Arnold Roy; Susan Lockhart; Kathryn Smith. 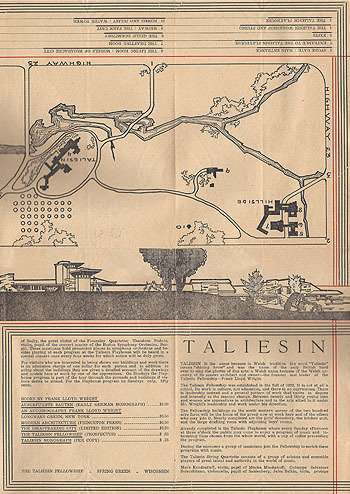 It includes three maps: Taliesin Spring Green Complex; Taliesin; Hillside. 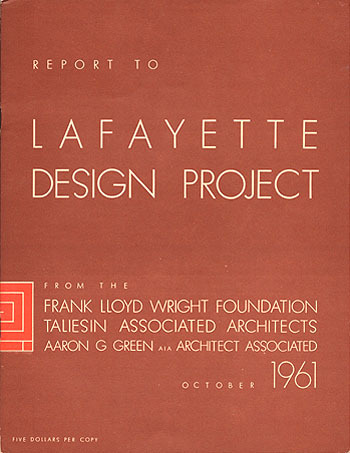 It also includes a list of Participants and a list of projects by the Taliesin Associated Architects. All are within a Frank Lloyd Wright Foundation Folder. Gift from Kathryn Smith. Size: 8.5 x 11, Folder, 9 x 11.75. 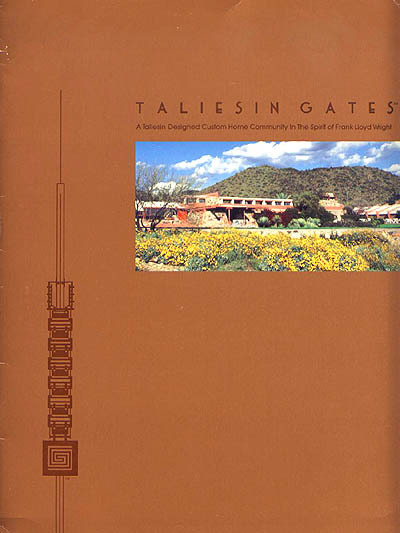 Description: Sales booklet, sections include Frank Lloyd Wright; Organic Architecture; Taliesin Gates; Community; Civilization, Beauty and Serenity; Taliesin Services. Samples designs by John Rattenburey, Arnold Roy, Charles Montooth, Tony Puttnam and Stephen Nemtin Thirty photographs and illustrations. 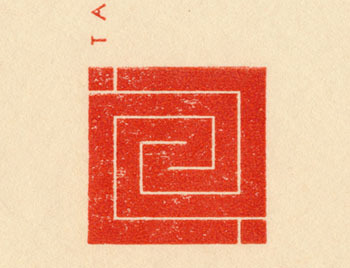 Includes photostat of logo. Description: In The Realm of Ideas. 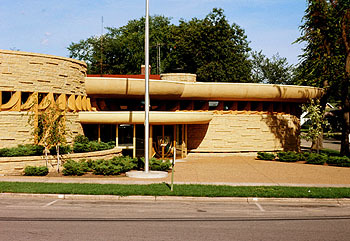 Frank Lloyd Wright characterized his work as an architecture of ideas. The Day at Taliesin will be built around the ideas of Space, Site, Material and Community in the form of lectures, discussions and activities. �In The Realm of Ideas� will be the title of a major touring exhibition that will open in Dallas, Texas in January 1988." Description: Informational brochure that describes the different facets of the foundation. 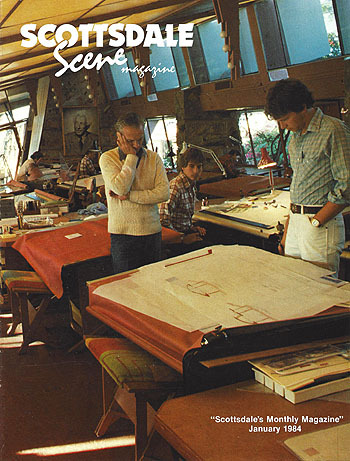 Sections include: Frank Lloyd Wright Foundation; Taliesin; Taliesin West; Taliesin Associated Architects; Frank Lloyd Wright Archives; Taliesin Gates Development Co.; Frank Lloyd Wright School of Architecture; Taliesin Council; Friends of Taliesin; Seminars; Tours. 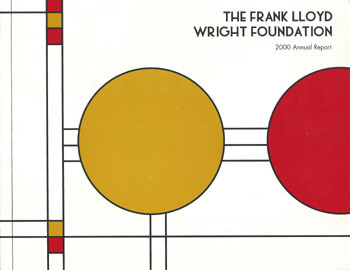 Description: Frank Lloyd Wright Foundation PR Folder used for promotional material. Description: Folder includes: 1) Schedule of Events 2) Taliesin Days Speakers: Ballinger; Gluckman; McClintock; Muller; Olsberg; Senkevitch; Shore; Uttal and Kathryn Smith. 3) Hosts and Hostesses: Some include: Cornelia Brierly; Richard Carney; Thomas Casey; Heloise Crista; Penny Fowler, Dixie Legler; Kenneth Lockhart; Susan Lockhart Lockhart; Charles Montoopth; Oscar Munoz; Frances Nemtin; William Wesley Peters; Bruce Brooks Pfeiffer; Ling Po; John Rattenbury; Kay Rattenbury; Arnold Roy. 4) Participants 5) The Frank Lloyd Wright Foundation 6) Frank Lloyd Wright School of Architecture 7) Taliesin Associated Architects 8) Books on and by Frank Lloyd Wright and Olgivanna Lloyd Wright. All are within a Frank Lloyd Wright Foundation Folder. Gift from Kathryn Smith. Author: The Taliesin Preservation Commission, Inc. 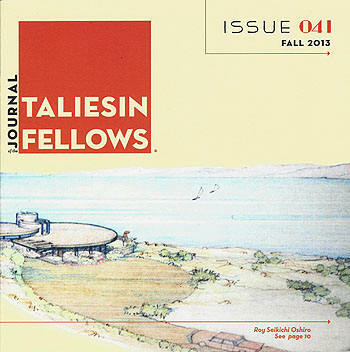 Description: Making a case for supporting the Taliesin Preservation Commission. 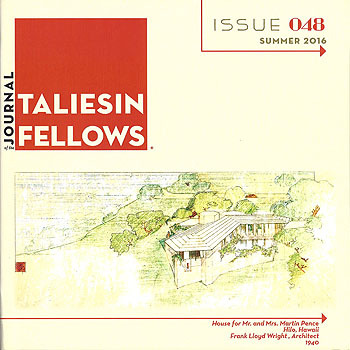 "Working in partnership to express one vision... preserving Taliesin for the 21st Century... 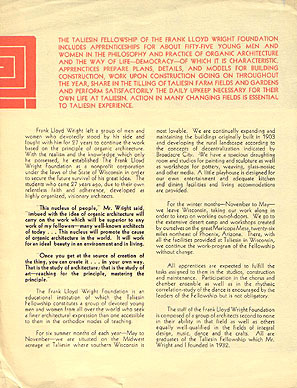 The Frank Lloyd Wright Foundation, Philosophy and Mission... 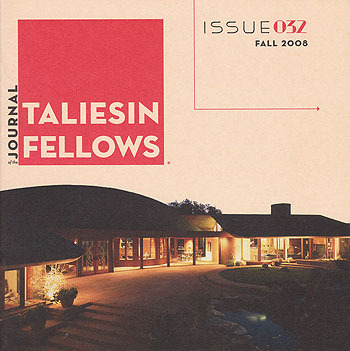 The Taliesin Preservation Commission, Inc... Taliesin History... Taliesin Today... Vision and Needs for the Future... Cultural Tourism... 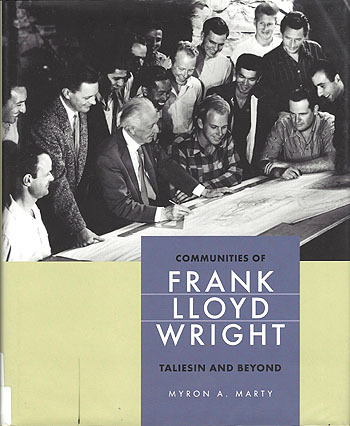 Proposed Taliesin Preservation and Visitor Center Estimates... Frank Lloyd Wright on Taliesin. Includes eight historic photographs by Pedro E. Guerrero. Gift from Kathryn Smith. 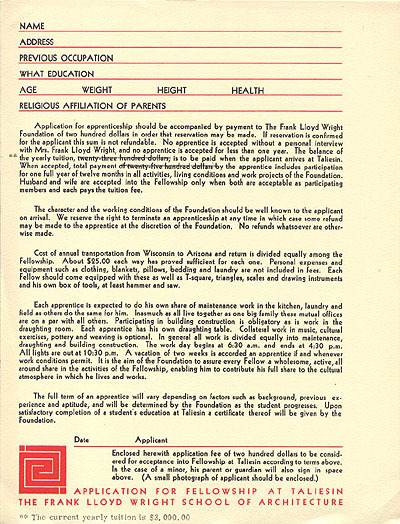 Description: Brochure describing the school, and a perforated reply card for requesting an application and more information. Includes three photographs. Two Color. Description: "Taliesin Architects is the continuation of the practice of architecture begun by Frank Lloyd Wright in 1893. As the firm enters its second one hundred years of architectural practice, it has rededicated itself to globally lead the exploration of Organic Architecture, provided superior service to its� clients and make an enduring contribution to the culture in which its works reside..." Photographs include Van Wezel Performing Arts Hall, Rocky Mountain National Park Visitors Center, Community Theater, San Jose, Vaikapu Valley Country Club and the Lincoln Income Life Insurance Co., 1994. Gift from Kathryn Smith. Author: Besinger, Curtis; Forward: O�Gorman, Thomas J. Author: Marty, Myron A. & Shirley L.
Description: 1) A letter from the Chairman and President / CEO. 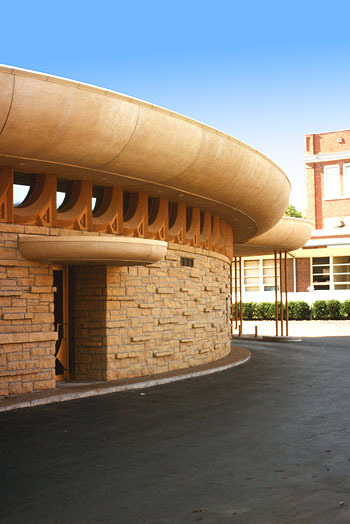 2) Frank Lloyd Wright School of Architecture. 3) Taliesin Architects. 4) William Wesley Peters Library. 5) Frank Lloyd Wright Archives. 6) Public Access. 7) Educational Outreach Program. 8)Taliesin Preservation Commission. 9) Development. 10) Members and Donors. Includes 21 photographs. Gift from Kathryn Smith. Title: John Howe in Minnesota. 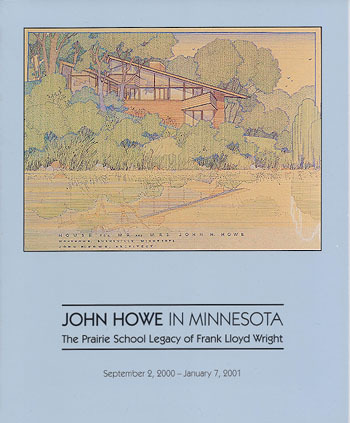 Description: The Prairie School Legacy of Frank Lloyd Wright. September 2, 2000 - January 7, 2001. The Minneapolis Institute of Arts, Minneapolis, Minnesota. 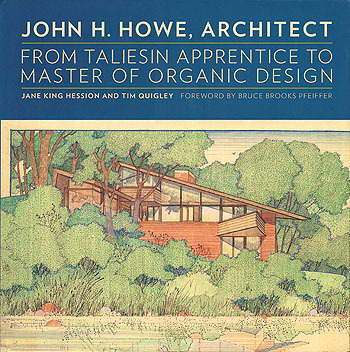 "For more than twenty years, John Howe was known as �the pencil in Frank Lloyd Wright�s hand.� As Wright�s chief draftsman at Taliesin from 1937 to 1959, Howe worked on such famous projects as the Johnson /wax Building in Racine, Wisconsin, the Unitarian �Church in Madison, Wisconsin, and the Guggenheim Museum in New York City. But Howe�s long association with Wright overshadowed his own significant achievements as an architect and designer... In Minnesota alone there are more than 80 Howe building, which are some of the finest examples of organic architecture in the Midwest." This is the first major presentation of drawings from the John Howe papers at the Northwest Architecture archives at the University of Minnesota. Includes seven illustrations and two photographs. Description: Brochure describing the school, includes fifteen photographs. 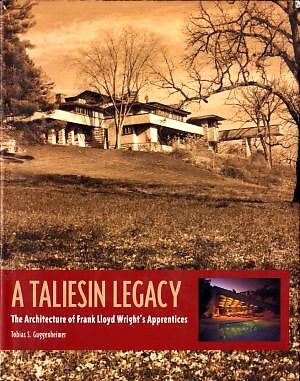 Description: "Frank Lloyd Wright�s Taliesin. Friday 19 November, Saturday 20 November. 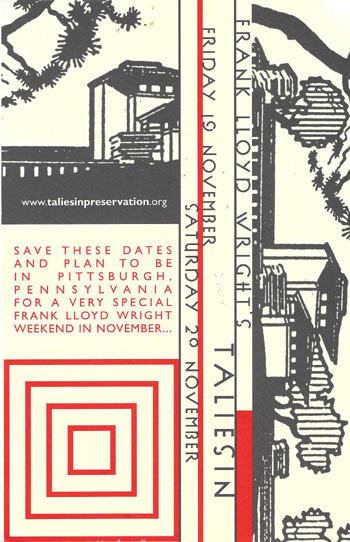 Save these dates and plan to be in Pittsburgh, Pennsylvania for a very special Frank Lloyd Wright weekend in November... 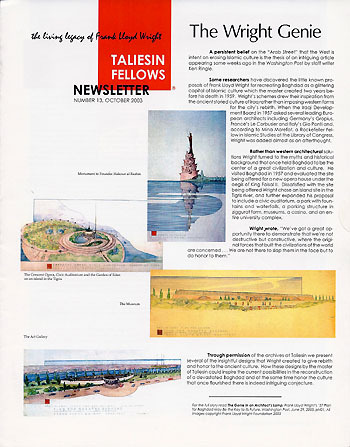 Reception with Taliesin Fellows and Taliesin Preservation, Inc... Private winter tours of Frank Lloyd Wright designed houses: Fallingwater and nearby Kentuck Knob... 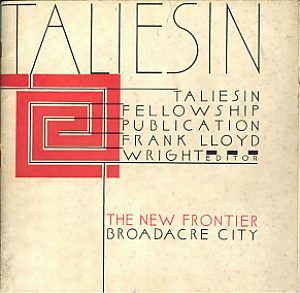 The graphic silhouette of Taliesin, designed in 1933 by Taliesin Fellow Gene Masselink, is Copyright � 2004." 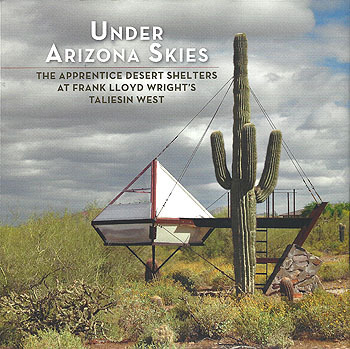 Published by Taliesin Fellows and Taliesin Preservation, Inc. Description: Press Release that accompanied the release of the book. 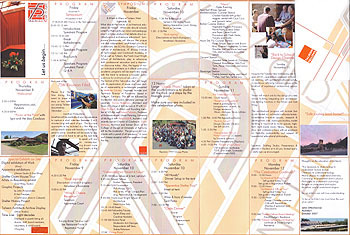 Description: Program and events. 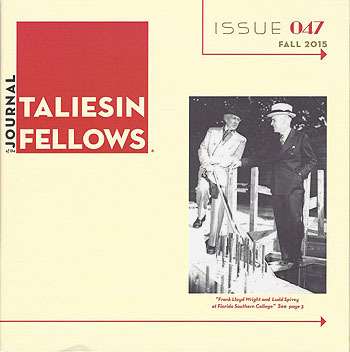 Taliesin Fellowship 75 Years. Reunion 2007, November 8-12, 2007, Taliesin West, Scottsdale, Arizona. Includes sixteen photographs. Forty-two small pages when folded. (First Edition) Gift from Randolph C. Henning. 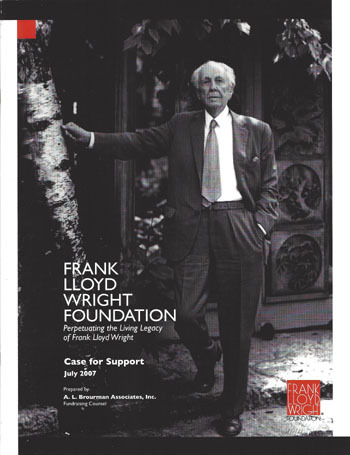 Description: Making a case for supporting the Frank Lloyd Wright Foundation. Frank Lloyd Wright... 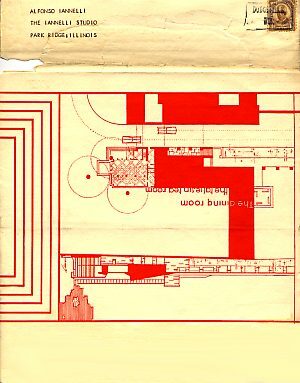 The Frank Lloyd Wright Archives... Vision and Mission... Building upon Strength... Taliesin and Taliesin West... Frank Lloyd Wright School of Architecture... Arts and Cultural Program... Launching a Capital/Endowment Campaign... Organizational History... Gift from Kathryn Smith. Author: Pfeiffer, Bruce Brooks; Sidy, Victor E.
Size: 3.5 x 6, opens to 16.9 x 6. 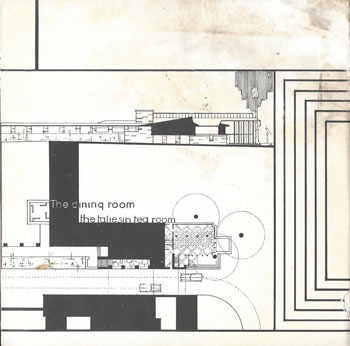 Title: Bank of Spring Green 1974 (Taliesin Associated Architects). Description: Set of five 35 mm slides photographed in 1974, two years after completion of the Bank of Spring Green, Spring Green, Wisconsin. Designed by William Wesley Peters, completed in 1972. 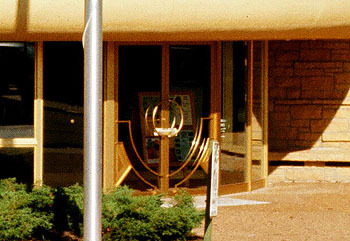 The circular theme is carried throughout the building. Constructed of native limestone, and oak paneling in the interior. The windows are set in precast concrete, tinted to blend with the limestone. Natural sunlight enters the building through a continuous band of windows as well as a skylight. Photographed by Douglas M. Steiner, September 1974. Size: 35mm color slides, 12.5 x 8.25 High Res digital image. 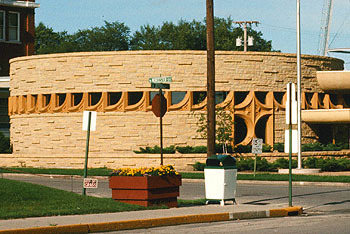 Title: Bank of Spring Green, exterior view, circa 1980's (Taliesin Associated Architects - 1972). 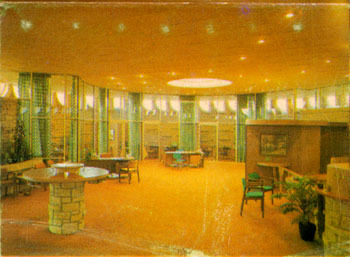 Title: Bank of Spring Green, interior view, circa 1980's (Taliesin Associated Architects - 1972). 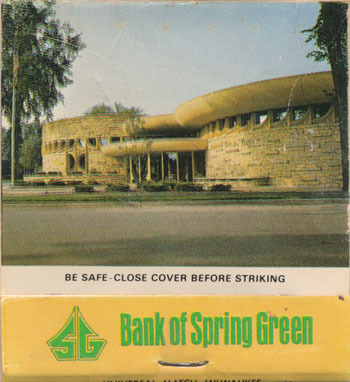 Title: Bank of Spring Green, Match Book Cover Circa 1980's (Taliesin Associated Architects - 1972). Description: "Bank of Spring Green." (Produced by Universal Match, Milwaukee. Front: Exterior view of the Bank of Spring Green. Verso: Interior view of the Bank of Spring Green. Title: Snow Flake Motel, Project Circa 1955. Aerial perspective of Snow Flake Motel. Description: Text bottom left corner, "Snow Flake." Red Square. Copy photograph of illustration. 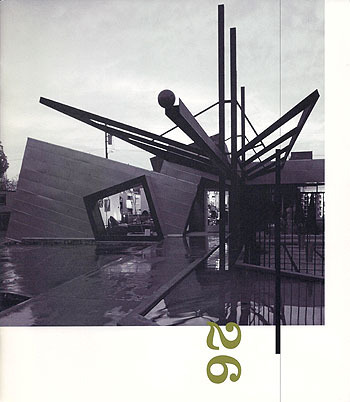 Published in "The Art of Frank Lloyd Wright, Krasl Art Center," Scott Elliot, 1994. Caption: "Aerial perspective of Snow Flake Motel, St. Joseph, Michigan, Ca. 1955. Pencil and pastel on brown tissue, 36 x 60 inches." In a recent e-mail from Scott Elliott, "Mrs. Sarkesian, the wife of the original client, confirmed that it (the drawing) was done in 1955. It's sometimes hard to tell who the actual draughtsman was by the mid 50s. Could be Peterson or Howe. Sometimes Wright just added trees, foliage and other atmospherics. Of course, he would have considered it entirely his, and rightly so. I happen to think this one could be all or mostly by his hand." From 2006: According to Scott Elliott: "(He) believes the Snowflake Motel in Lincoln Township was designed by famed architect Frank Lloyd Wright, contrary to what most people think. Many people believe the building was designed around 1960 by William Wesley Peters of Taliesin Associates. Peters was Wright's son-in-law and a draftsman for Wright. But Elliott has a detailed drawing from Wright's office showing the Snowflake Motel, and said that drawing was completed around 1955. Elliott said Sahig and Christina Sarkisian, the original owners of the Snowflake, approached Wright around 1955 to design the motel. A lack of financing delayed the project until the early 1960s, he said. Wright died in 1959.... Elliott... said he bought the drawing from one of the Snowflake owners in the late 1980s or early 1990s. The owner told him the Sarkisians had first approached Wright's office around 1955, and that's when the drawing was made." As far as absolutely unquestionable proof, I don't have that," Elliott said. "It's what I would say is a very reliable oral history. "Elliott said it's likely that Peters took credit for the design when he completed the commission. Peters may have been the original draftsman, though Elliott said he thinks it's "far more likely" that chief draftsman Jack Howe did that work. Peters' later drawings of the building are marked differently, and the drawing is "clearly from an earlier period," Elliott said. "I believe absolutely certainly that this is an original Wright concept and design," Elliott said. "But even if all this weren't true � the concept, the design is so good and so pure in terms of following Wright's principles and ideas. There isn't an idea anywhere (in the design) that doesn't stem from Wright's design philosophy." The Herald Palladium, St. Joseph, Michigan, William F. Ast III, January 21, 2006. Bruce Brooks Pfeiffer does not list the Snow Flake Motel in "Frank Lloyd Wright, Complete Works 1943-1959," 2009. Size: 10 x 6.5 Color Photograph. Title: Snow Flake Hotel Circa 1961 (Taliesin Associated Architects - 1961). 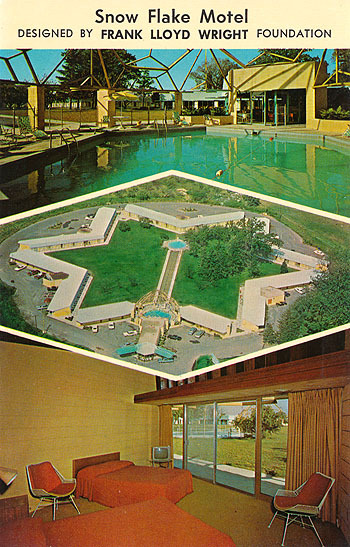 Title: Snow Flake Motel Circa 1964 (Taliesin Associated Architects - 1961). Description: View of the motel from the center. "Snow Flake Motel. Designed by Frank Lloyd Wright Foundation." Aerial view of motel. Verso: "Snow Flake Motel. 3822 Red Arrow Hwy., St. Joseph, MI 49085. �Michigan's Most Unique Motel.� 58 Spacious Rooms - Colored TV - Direct Dial Phones - Swimming Pool - Cocktail Lounge - Restaurant - Cable - 4 Miles from Swimming Beach at Lake Michigan. Located 1 Mile North of I-94 - Exit 23, just 5 minutes south of Saint Joseph Michigan. Snow Flake Motel. Designed by Frank Lloyd Wright Foundation. #8187-E." According to the National Registry of Historic Places: "Around 1958, Sahag Sarkisian. a wealthy oriental rug dealer in St. Joseph . 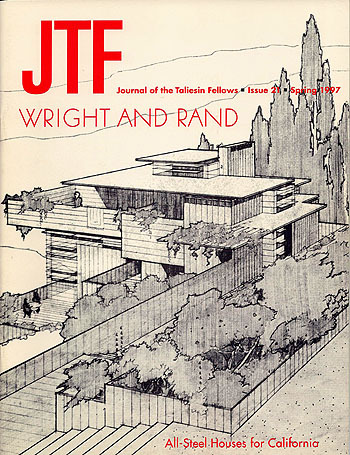 approached Frank Lloyd Wright's Taliesin Fellowship (which became Taliesin Associated Architects after Wright's death) about designing a unique luxury motel for his recently purchased property... Sarkisian got the idea to consult Wright from his friend Carl Schultz, who had just moved into his new residence in St. Joseph designed by the architect. The extent of Wright's direct involvement in the design remains unclear, but he is said to have flown over the proposed site and approved it . (1) (Interview with Carlene Lymburner. who with her husband purchased the Snow Flake from Sarkisian in 1979. 1 December 1997.) 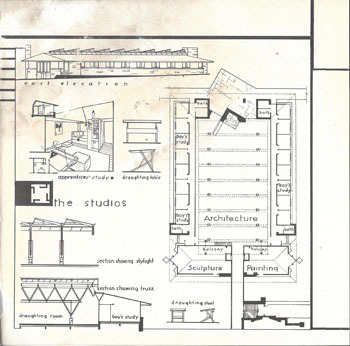 ...Sarkisian signed the contract with Taliesin Associated Architects in June 1960, and Peters signed the complete set of plans and specifications on 30 August. Construction finally began in the summer of 1961, and the eye-catching hostelry, now called the Snow Flake Motel, opened for business the following year." But, according to Scott Elliott: "(He) believes the Snowflake Motel in Lincoln Township was designed by famed architect Frank Lloyd Wright, contrary to what most people think. Many people believe the building was designed around 1960 by William Wesley Peters of Taliesin Associates. Peters was Wright's son-in-law and a draftsman for Wright. But Elliott has a detailed drawing from Wright's office showing the Snowflake Motel, and said that drawing was completed around 1955. 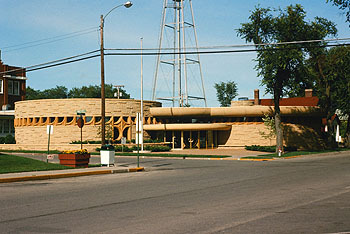 Elliott said Sahig and Christina Sarkisian, the original owners of the Snowflake, approached Wright around 1955 to design the motel. A lack of financing delayed the project until the early 1960s, he said. Wright died in 1959.... Elliott... said he bought the drawing from one of the Snowflake owners in the late 1980s or early 1990s. The owner told him the Sarkisians had first approached Wright's office around 1955, and that's when the drawing was made." As far as absolutely unquestionable proof, I don't have that," Elliott said. "It's what I would say is a very reliable oral history. "Elliott said it's likely that Peters took credit for the design when he completed the commission. Peters may have been the original draftsman, though Elliott said he thinks it's "far more likely" that chief draftsman Jack Howe did that work. Peters' later drawings of the building are marked differently, and the drawing is "clearly from an earlier period," Elliott said. "I believe absolutely certainly that this is an original Wright concept and design," Elliott said. "But even if all this weren't true � the concept, the design is so good and so pure in terms of following Wright's principles and ideas. There isn't an idea anywhere (in the design) that doesn't stem from Wright's design philosophy." The Herald Palladium, St. Joseph, Michigan, William F. Ast III, January 21, 2006. 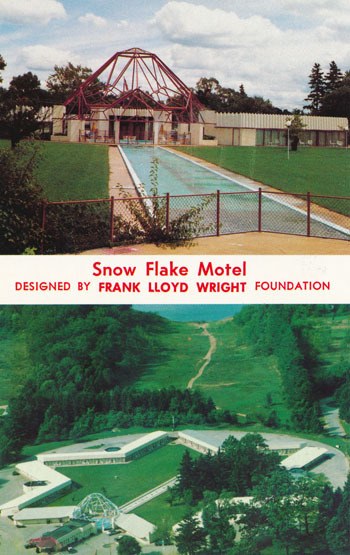 Bruce Brooks Pfeiffer does not list the Snow Flake Motel in "Frank Lloyd Wright, Complete Works 1943-1959," 2009. Description: 1) From Taliesin. 2) Mission Statement. Sighed by Paul Bogart, Robert Clark, Don Fairweather, John Geiger, Bradley Storrer, Louis Wiehle, Eric Lloyd Wright. 3) Updates: Zimmerman, Freeman and Hollyhock Houses. 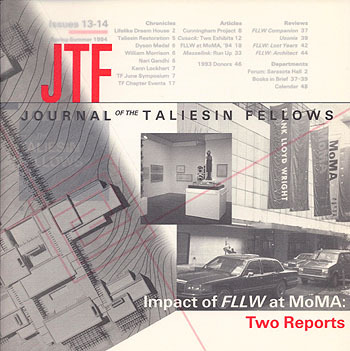 4) News: Fay Jones is first Taliesin Fellow to Receive AIA Gold Medal. 5) Restoring Frank Lloyd Wright Office at Taliesin West. 6) Earthquake repairs to Hanna House Estimated at $1,000.000. 7) Assessing the Character of Wright�s Legacy. 8) Lawrence Memorial Library Remains Spark Restoration Effort. 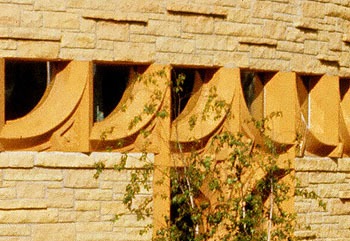 9) Auguste Perret Visits Taliesin. 10) Book Review: Romanza. Includes seven photographs and two illustrations. Original List Price $8.33. Gift from Gerald Klitz. Description: 1) Rebuilt Hollyhock Furniture Re-stablishes Scale for Living Room. 2) Guggenheim Call Addition "Restoration". 3) A Day at the Auction, Or, How to Strip a Prairie house for Fun and Profit (Coonley). 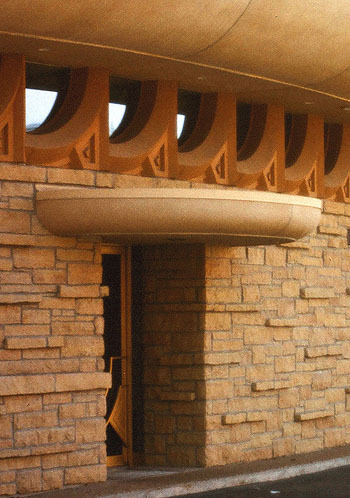 4) The neglected Legacy of Frank Lloyd Wright. 5) A Sujmmer�s Work - Not in The Taliesin Drafting Room (Neils House) 6) Realizing Wright�s Usonian Design for the Zimmermans. Includes thirteen photographs and four illustrations. Original List Price $8.33. Gift from Gerald Klitz. Description: 1) FLlW Oral History Project Planning Begins at Wingspread Conference 2) Work of FllW Apprentices to Be Subject of First Major Critical Study 3) Recollection - Masonry 101. Classes at Taliesin Not in the Collegiate Mold 4) Recollection - Christmas, 1940. 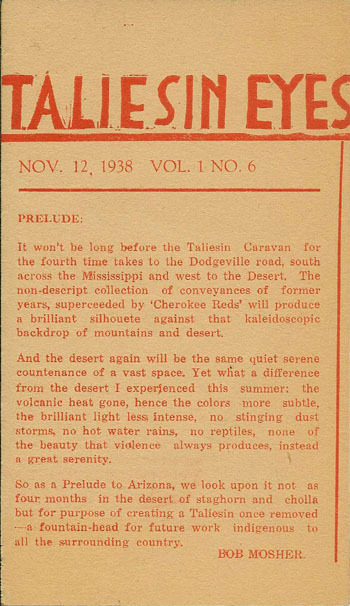 Desert Storm Isolates Taliesin in a Sea of Mud 5) Critique of a Restoration. God Is Also in the Dan House Details 6) Biozarre FBI File on Wright Exposed by Phoenix Newspaper. 7) A Trip to Buffalo. 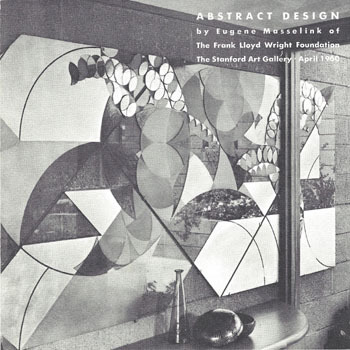 How the Taliesin Theater Acquired Its Door Handles 8) Changing Patterns, 1934. 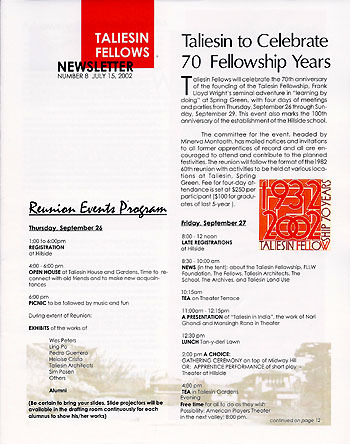 Historic [and Other] Events of a First Fellowship Year. Includes nine photographs. Original List Price $8.33. Gift from Gerald Klitz. Description: 1) A Farewell to Wes 2) What Did Mr. Wright Mean By "Organic"? 3) As Catalyst for Fallingwater, Edgar Kaufmann, Jr. Made A Noble Contribution 4) Review of Exhibition. Something Out of Focus in "Wright in Hollywood". 5) Cartier-Bresson Visit With FLLW. A Trace of Catalonian Mystique at Taliesin? 6) Lautner Work Sets Benchmark For Future of Organic Architecture. Includes seventeen photographs and three illustrations. Original List Price $12.50. Gift from Gerald Klitz. 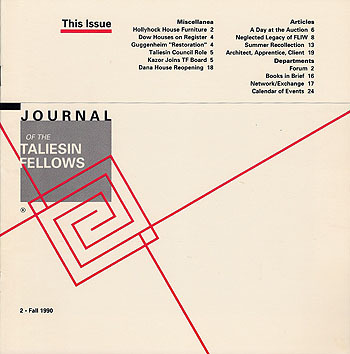 Description: 1) The Wonderful World of Taliesin: My Twenty Years on Its Fringes. 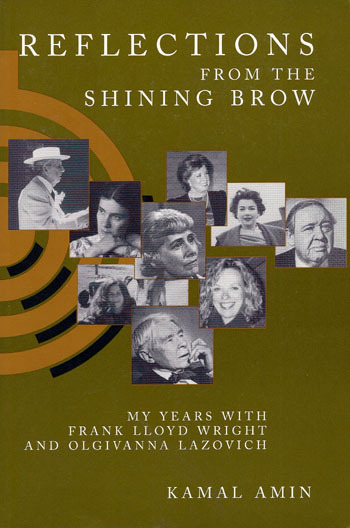 2) Book Reviews: Frank Lloyd Wright by Marie Costantino. 3) Book Reviews: An Architecture for Democracy. The Marin County Civic Center by Aaron Green. 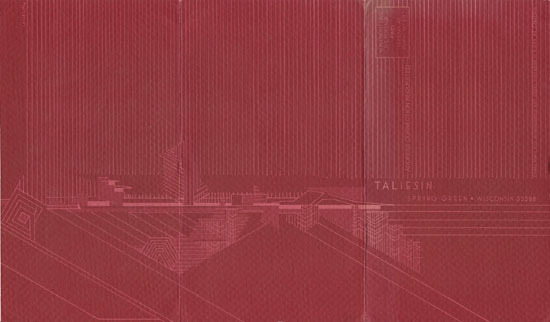 4) Book Reviews: At Taliesin by Randolph Henning. 5) The Work of John Howe. Assured Interpretation of Wright�s Principles. 6) John Howe Reminisces. From 18 Years Old Apprentice to FLLW's Chief Assistant. Includes fifteen photographs and seven illustrations. Original List Price $12.50. Gift from Gerald Klitz. 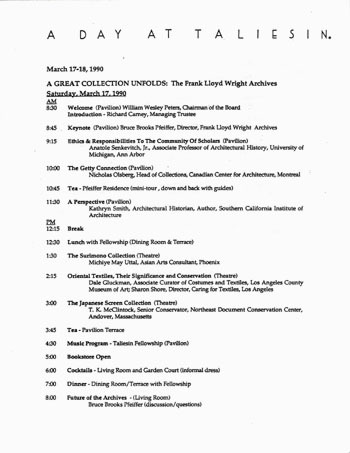 Description: 1) Forum 2) "Shining Brow": The Opera 3) Fellows Plan Three Day Celebration in Los Angeles for FLLW 125th. 4) Morton Delson and The Kalil House. 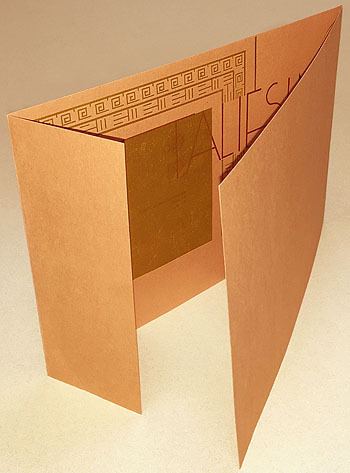 The Making of a "Usonian Automatic"
5) Book Review: To See Without Being Seen. The Wright Space. 6) Wes: A Fable 7) Work of Wallace E. Cunningham 8) FLLW Archives Calls for Slides From Taliesin Fellows. Includes 20 photographs and 13 illustrations. Original List Price $11.75. Two copies. One copy gift from Gerald Klitz. Description: 1) Capacity Crowd Joins in FLLW 125th. 2) A Farewell to Bob Mosher 1909-1992. 3) Hanna Honeycomb House Restoration Outlined. 4) FLLW Foundation Looks to Future. 5) Land Swap Secures Buffer Zone for Taliesin West. 6) Master Plan. 7) Archives Makes FLLW Legacy Available to World. 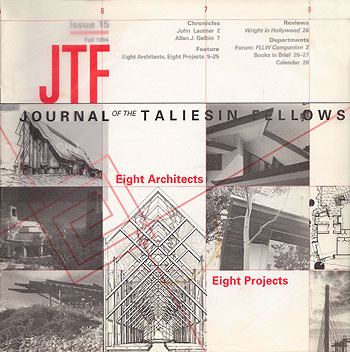 8) From Taliesin Fellowship to Accredited School of Architecture. 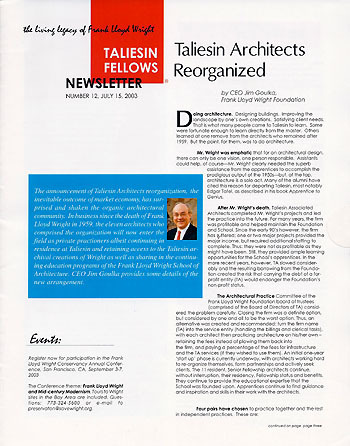 9) Transition of Leadership for Taliesin Architects. 10) Financial Goals and Fund Raising Programs. 11) The �Oakland Philosophy' Ascendant. 12) Two New York Exhibitions: A Study in Contrasts. Includes six photographs and three illustrations. Original List Price $11.75. 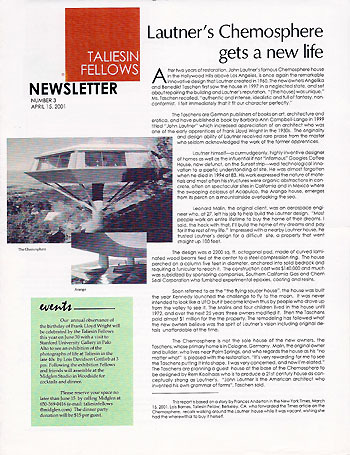 Description: 1) Fellowship�s 60th Birthday: "Especially Designed..." 2) Taliesin, Midway, hillside, and a Visitor Center . 3) FLLW, Henry Ford and the Road Back to the Farm. 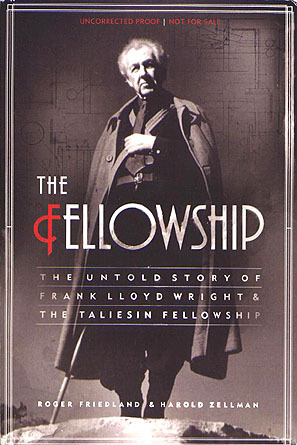 4) Books: Frank Lloyd Wright Between Principle and Form. By Laseau and Tice. 5) Books: At Taliesin. By Randolph Henning. 6) The Magical Realm. Wright�s Heightened Consciousness Touched All. Includes fifteen photographs and three illustrations. Original List Price $13.75. Gift from Gerald Klitz. Description: 1) Taliesin Vintners. 2) How Mr. Wright Saved me from the Coils of College. 3) Hollyhock House: Given due attention in Print, but slighted in City Budget (Review of four books). 4) Schindler - Wright Exchange. 5) Modeling the Head of Frank Lloyd Wright. Includes thirteen photographs. Original List Price $13.75. Two copies. One copy gift from Gerald Klitz. Description: 1) Fay Jones Symposium. 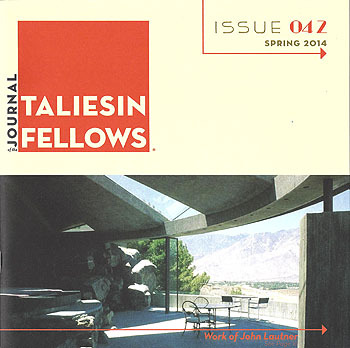 2) "Talking at Taliesin": Reflections on a Roundtable Discussion. 3) Tracing a Road Through the Domains of Masters. 4) Wichita Symposium. Usonia the Beautiful: the Dreams and the Realities. 5) Books. Frank Lloyd Wright. A Biography by Secrest. 6) Books. Frank Lloyd Wright. Remembered by Meehan. 7) Structural Elegance and a Sense of Reverent Space. Includes thirty-three photographs and nine illustrations. Original List Price $13.75. Two copies. One copy gift from Gerald Klitz. Description: 1) "In the Cause of Architecture" Symposium Draws 200 to Fellows� Event. 2) A Conversation with Vladimir Karfik. Architect Worked for Both Le Corbusier and Wright. 3) Edmund Teske, Photographer. 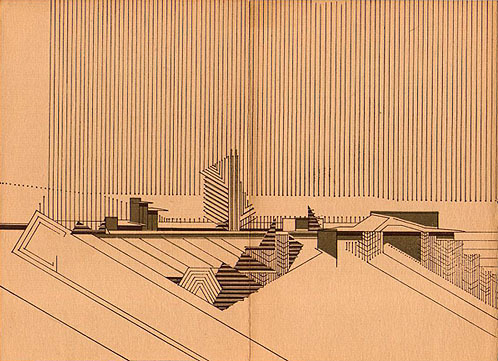 A selection from Work for Frank Lloyd Wright. Includes nineteen photographs (eight by Teske) and three illustrations. Original List Price $13.75. Gift from Gerald Klitz. Author: Editor: Wiehle, Louis 1) Wiehle, Louis 3) Hoffmann, Donald 4) Cusack, Victor A. 5) Reidy, Peter 6) Sweeney, Robert L.
Description: 1) Malibu Fire Engulfs Eric and Mary Wright Property But Much is Saves. 2) MOMA�s Massive FLLW Exhibit Opens February 20. 3) The Builder at Bear Run. 4) Guggenheim Redux 5) Books: About Wright: Recollection by Those Who Knew Him, By Tafel. 6) John son Compound, Death Valley. A Long Misunderstood Wright Design for California. 7) Two New Lautner Design Shaped by Client Specifics. 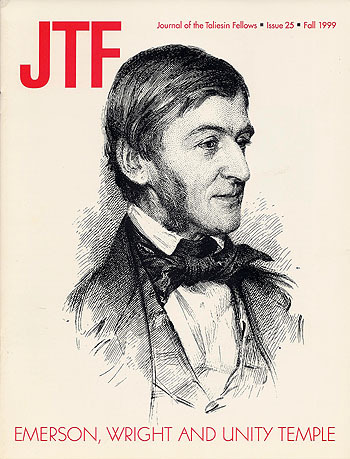 Includes fifteen photographs and twenty-five illustrations. Original List Price $10.00. Gift from Gerald Klitz. Description: 1) A Lifelike Dream House 2) Courtyard House in Rancho Santa Fe 3) Two Retrospectives in Retrospect. Frank Lloyd Wright at the MOMA: Shows in 1940 and 1994 Compared and Contrasted. 4) Frank Lloyd Wright at the MOMA 1994. Includes comments by Kamal Amin, Fred Chriss, Darrel Couturier, Wallace Cunningham, Grattan Fill, Roderick Grant, Aaron G. Green, Tobias Guggenheimer, Mark Heyman, Thomas Olson, John Reed, Roland Reisley, William Storrer, Merle Sykora, Eric Lloyd Wright. 5) Run Up. 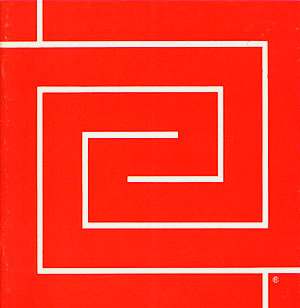 6) Books: The Frank Lloyd Wright Companion, Storrer, 1993. 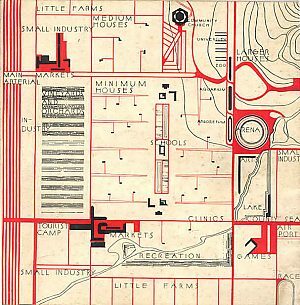 7) Books: Usonia, Frank Lloyd Wright's Design for America, Rosenbaum, 1993. 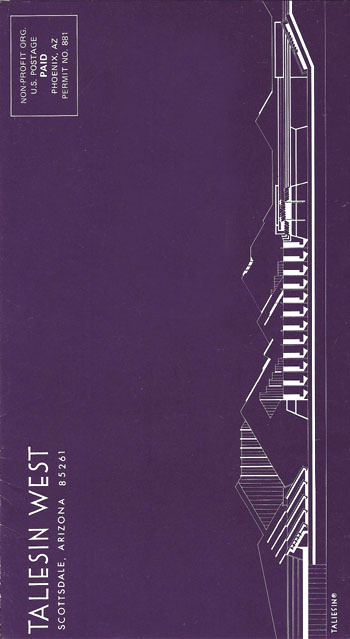 8) Books: Frank Lloyd Wright, The Lost years 1910-1922, Alofsin, 1993. 9) Books: Frank Lloyd Wright, Architect, Riley, 1994. Includes forty-five photographs and twelve illustrations. Original List Price $12.50. Gift from Gerald Klitz. Description: 1) John E. Lautner, 1933-39. 2) Allan J. Gelbin, 1949-53. 3) Eight Architects, Eight Projects: Caciola: Hollywood Hills; Dyson: Madera County, CA; Green: Pebble Beach; Jones, Jennings: Whittier, CA; Liebhardt: La Jolla, CA; Stricker, Seattle; Swaback, Pinnacle Peak, AZ; Wiehle, Los Angeles. 4) Books: Wright in Hollywood, Sweney, 1994. Includes thirty-one photographs and forty-two illustrations. Original List Price $12.50. Number of copies printed: 700. Gift from Gerald Klitz. Description: 1) A Season�s Greeting to All Our Members and Friends. 2) Taliesin Fellow Biographical Questionnaire. 8.5 x 8.5. Gift from Gerald Klitz. Description: 1) James De Long Houses Honored as City Cultural Monuments. 2) Nari�s Rock. 3) The Other Side of Wartime "Cloverleaf" Housing Story. 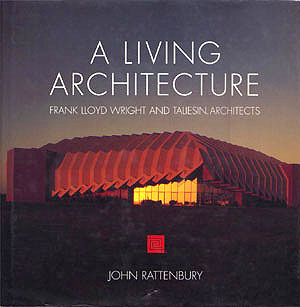 4) Books: John Lautner, Architect. Escher, 1994. 5) Book: My Father Who is on Earth. Wright, 1994. Includes twenty-six photographs and twenty-four illustrations. Original List Price $25.00. Gift from Gerald Klitz. Description: 1) Fellows� Auldbrass Tour Gathers 200 Enthusiasts. 2) John Lautner, A Tribute. 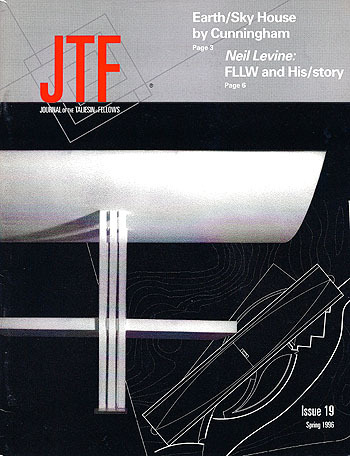 Over fifty tributes including Julius Shulman, Herb Greene and Bruno Zevi. 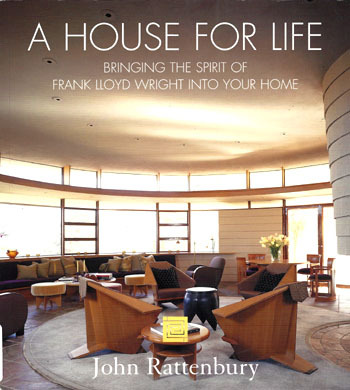 3) Books: Frank Lloyd Wright and the Meaning of Material. Patterson, 1994. Includes thirty-nine photographs and nine illustrations. Original List Price $25.00. Gift from Gerald Klitz. 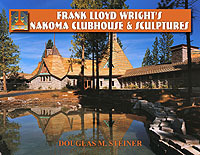 Author: Editor: Wiehle, Louis 1) Van Doren, Phyllis 2) Levine, Neil 3) Heyman, Mark; Komanecky, Michael 4) Kingsbury, Pamela D.
Description: 1) Reclaiming Sea and Sky 2) Frank Lloyd Wright and His/story. An Inclusive View. 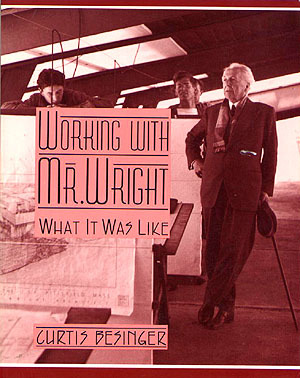 3) Books: Working with Mr. Wright: What It Was Like. Besinger, 1995. 4) Author, Architect, Teacher, Curtis Besinger Is Also Meticulous Observer. Includes nineteen photographs and twenty-one illustrations. Original List Price $25.00. Gift from Gerald Klitz. 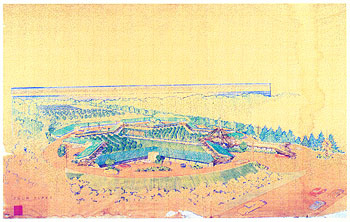 Description: 1) Cudworth Beye, Frank Lloyd Wright and the Yahara River Boathouse, 1905. 2) How the Beye Letters Were Discovered. 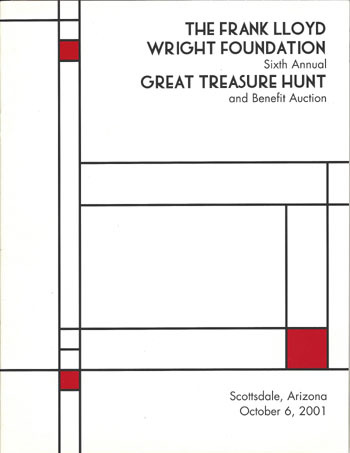 3) The Bridge Caf� 4) Books: Frank Lloyd Wright�s Dana House. Hoffmann, 1996. 5) Philip Johnson: Life and Work. Schulze, 1994. 6) John de Koven Hill, 1920-1996. Includes five photographs and fourteen illustrations. Original List Price $25.00. Number of copies printed: 1,000. Gift from Gerald Klitz. Description: 1) Wright and Rand 2) The Way it Was 3) Books: Letters of Ayn Rand. Berliner, 1995. 7) Kay Schneider Rattenbury. Includes eleven photographs and nineteen illustrations. Original List Price $25.00. Gift from Gerald Klitz. Description: 1) Robert Beharka and the Countenance of Principle. 2) Retrospection. A Personal Recollection. 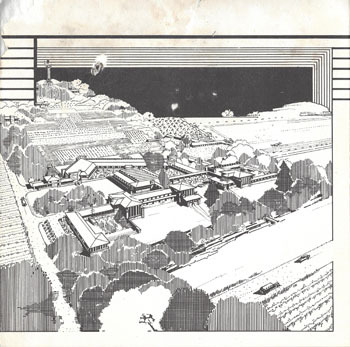 3) A Porfolio of Wright�s Farm Designs. 4) A Progress Report: The Darwin D. Martin House. 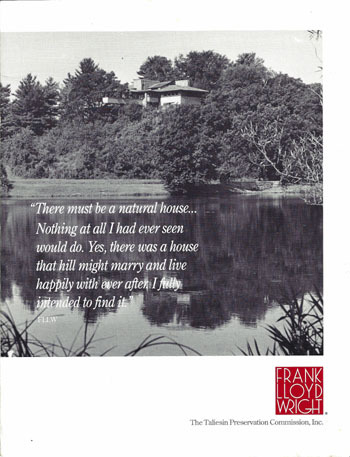 5) Books: Down to Earth: An Insider�s View of Frank Lloyd Wright�s Tomek House. Moran, 1995. 6) Grant Carpenter Manson, 1904-1997. Includes fifteen photographs and thirty-four illustrations. Original List Price $25.00. Gift from Gerald Klitz. 4) Waters, Katrina K. 5) Storrer, Bradley R.
Description: 1) "The Pencil in Frank Lloyd Wright�s Hand." An interview of Howe, June 4, 1987. 2) To our Architect John Henry Howe, a small belated note of gratitude in appreciation of his elegantly eloquent life. 3) Books: Unity Temple: Frank Lloyd Wright and Architecture for Liberal Religion. 4) Elizabeth Bauer Kassler, 1904-1998. 5) Richard E. Carney, 1923-1998. Number of copies printed: 1,000. Includes eleven photographs and seven illustrations. Original List Price $50.00. Two copies, One copy gift from Gerald Klitz. Description: 1) Trees For Taliesin. 2) No, Don... Don�t So It. 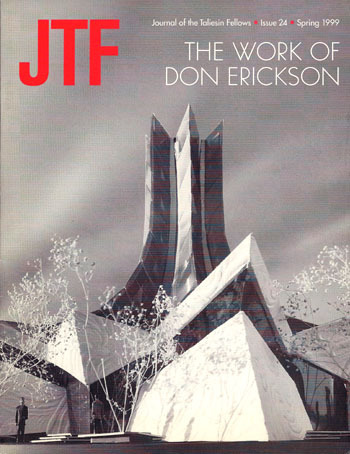 3) Don Erickson: The Work. 4) Books: Frank Lloyd Wright and Midway Gardens. Kruty. 5) Herbert Fritz Jr., 1915 - 1998. 6) Jim Charlton, 1919-1998. 7) A Life. Jim Charlton brief Autobiography. Includes thirteen photographs and nine illustrations. Original List Price $25.00. Gift from Gerald Klitz. Description: 1) Emerson, Wright and Unity Temple. Includes four photographs and three illustrations. Original List Price $25.00. Gift from Gerald Klitz. 5) Storrer, Bradley R. 6) Kingsbury, Pamela D.
Description: 1) Introduction: Eugene "Gene" Masselink. 2) 1910 1962, Masselink. 3) Dyson. The Architecture of Arthur Dyson. 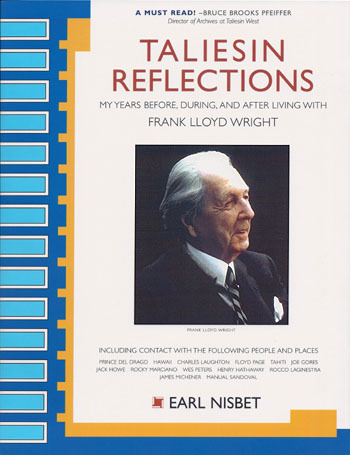 4) Reviews: Frank Lloyd Wright�s Taliesin Fellowship. Marty. 5) In Memory. John Hemingway Benton. 6) Curtis Wray Besinger 1914-1999. Includes thirty-two photographs and five illustrations. Original List Price $25.00. Gift from Gerald Klitz. Description: 1) President�s Letter. 2) Enhancing The Grid: Apprentices in Europe. 3) Letters To The Fellows. 4) At 21 I Came to Taliesin. The Work of David Dodge. 5) The Desert Shelters: Trevor Pan. 6) Noteworthy Books. 7) Chronicles: Autumn 06. 8) Calendar. Includes 18 photographs. Description: 1) President�s Letter. 2) Box Phase II. Presentations & Critiques. 3) Letters To The Fellows. 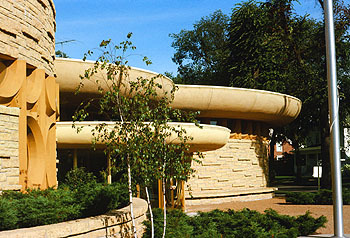 4) The Frank Lloyd Wright School of Architecture. "Apprnetis En Charrette." 5) Architect Rustam C. J. Patell. 6) Apprentice "Pod Project." 7) "The Box" Story. 8) Hurricaneproof Home by Architect Calvin L. Stempel. 9) Noteworthy Books. 10) Chronicles: Spring 07. 11) Calendar. 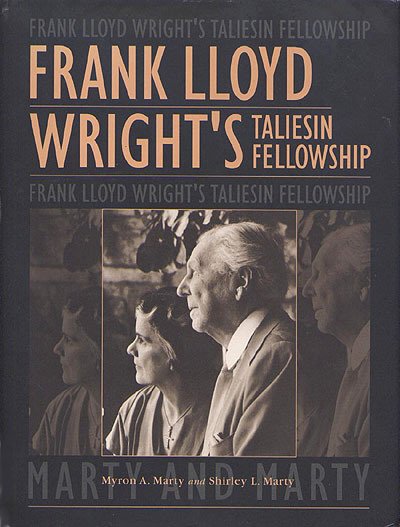 12) 75th Anniversary of the Founding of the Taliesin Fellowship. Includes 88 photographs and illustrations. Description: 1) President�s Letter. 2) Foundation News. 3) Letters To The Fellows. 4) Building Upon My Taliesin Experience. 5) Apprentice Shelter. 6) Architect Larry Brink 7) Mr. Wright�s Grader. 8) Compactcare: A Rehabilitation Clinic for Respiratory Patients in Rotterdam. 9) Charette At Taliesin. 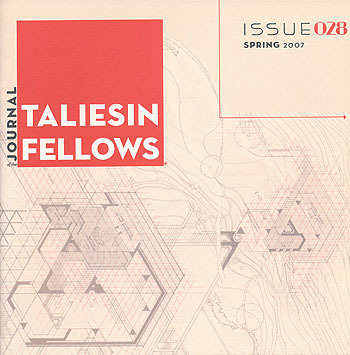 10) Taliesin: Professional Practice: 2007. 11) Noteworthy DVD and Books. 12) Chronicles: Summer 07. 13) Calendar. 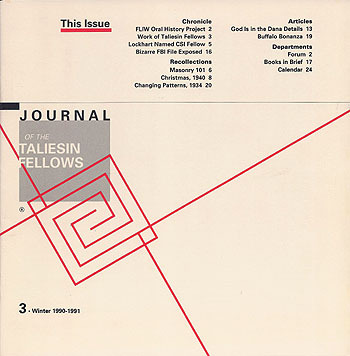 14) 75th Anniversary of the Founding of the Taliesin Fellowship. Includes 44 photographs and illustrations. Description: 1) President�s Letter. 2) Foundation News. 3) Editor�s Word 4) Letters To The Fellows. 5) Dean�s Message. 6) Foundation CEO Message. 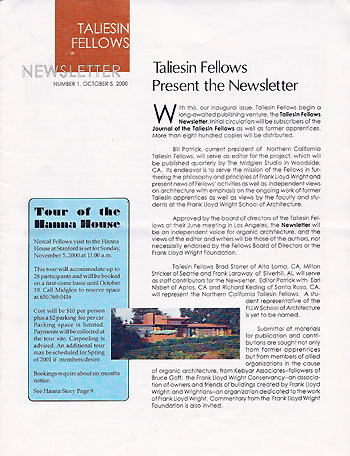 7) Taliesin Fellows News. Welcome new board members. 8) The Prairie School. 9) The Migration. 10) Painter / Sculptor Val M. Cox. 11) Chronicles: Autumn 07. 12) Voices: Robert K. Mosher (32-42) - Taliesin Giving a continuing history. 13) The Pied Piper at Yale. 14) Noteworthy Book. 15) Decoding A Genuine Taliesin Nonesuch. 16) Calendar. 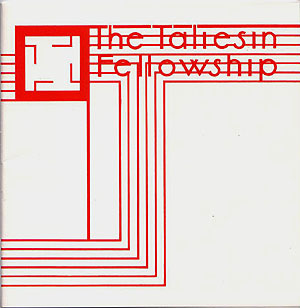 17) 75th Anniversary of the Founding of the Taliesin Fellowship. Includes 56 photographs and illustrations. Description: 1) President�s Letters. 2) Editor�s Word. 3) Dean�s Letter. 4) Foundation CEO Message. 5) Variations on a Theme: The Grand Tour. 6) The 75th Reunion. 7) The work of Nezam Amery. 8) Before Dubai: Nezam Amery and the Dream of Iranian Tourism. 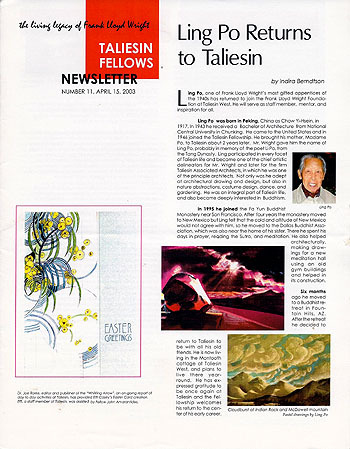 9) Taliesin Arts & Cultural Program. 10) Voices. Yen Liang (32-34) "Remembering Yen Liang." 11) Chronicles: Spring 08. 12) Nawantale. Uganda Community School Project, Inc. 13) Noteworthy Books. 14) Calendar. Includes 93 photographs and illustrations. Description: 1) President�s Letter. 2) Dean�s Lettere. 3) Editor�s Word. 4) Graduation at Taliesin. 5) Taliesin artist residency program. 6) Penwern Boathouse Restoration. 7) Voices. 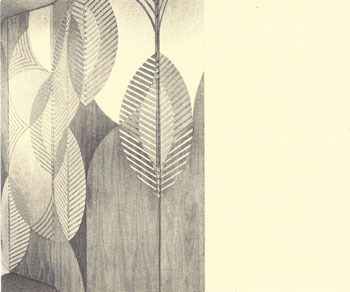 Noni & Irene Buitenkant, excerpts from the Oral Histories of the Frank Lloyd Wright Archives. 8) California Residence. 9) Taliesin Growth. 10) Chronicles: Fall �08. 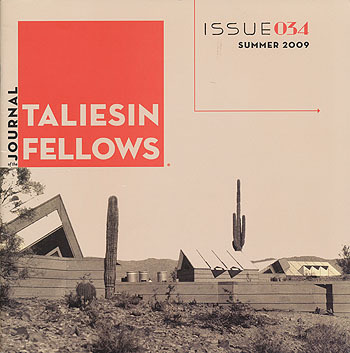 11) Taliesin Fellows. Board Meeting June 2008, Taliesin, Spring Green. 12) Calendar. The Frank Lloyd Wright School of Architecture. Includes 51 photographs and illustrations. Gift from Kathryn Smith. Description: 1) President�s Letter. 2) Foundation CEO Message. 3) Chronicles: Winter �09. 4) Dean�s Message. 5) Editor�s Word. 6) Learn by Doing. 7) Voices. Bruno Zevi. 8) The Fawcett House. 9) A Meditation. 10) Remembering Two Bay Area Architects. Charles Warren Callister and Jack Pershing Hillmer. 11) University of Hawaii Presentation. 12) Liljestrand House. 13) Calendar: Guggenheim Exhibition. 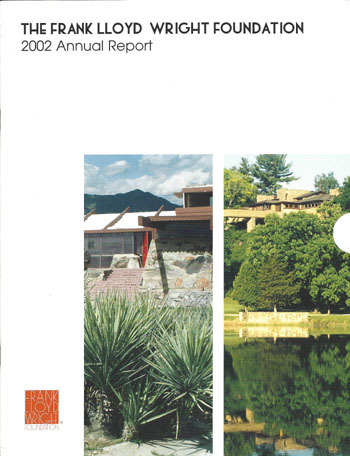 14) The Frank Lloyd Wright School of Architecture.. Includes 53 photographs and illustrations. Description: 1) Editor�s Word. 2) President�s Message. 3) Dean�s Letter. 4) Foundation COO Message. 5) Fellows Board bocuses on direction. 6) It takes some nerve... 7) Meditation II. 8) The defining moment. 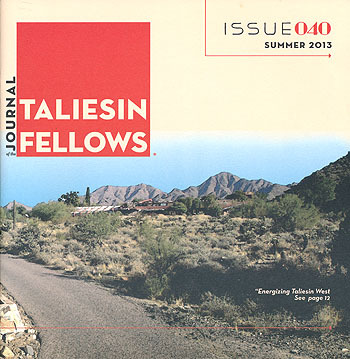 9) Ocotillo 10) New Taliesin Fellows board directors. 11) Voices. Nettie Weston Cunningham, excerpts from a March 1991 Oral Histories of the Frank Lloyd Wright Archives. 12) Historic structure report: Drafting Studio. 13) Life Cycles. 14) Noteworthy Books. 15) Chronicles: Summer �09. 16) Calendar. Includes 51 photographs and illustrations. Gift from Kathryn Smith. Description: 1) Editor�s Word. 2) Outgoing President�s Message. 3) Incoming President�s Message. 4) Dean�s Letter. 5) Sole Searching: A Taliesin Reflection. 6) A Day in Volterra 7) The tree house renovation 8) Birth of a radio station: From apprentice desk to on-the-ground. 9) In Memoriam: William Arthur Patrick (1919-2009). 10) New Taliesin Fellows Board Directors. 11) Voices. Frank Lloyd Wright, To The Young [Person] In Architecture. 12) Noteworthy Books. 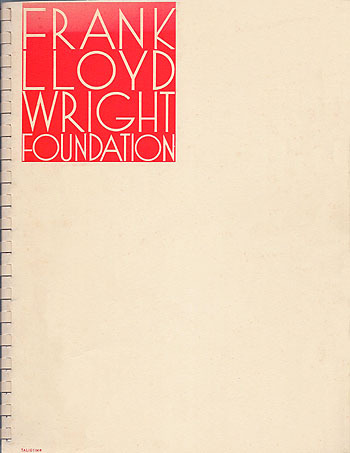 13) Wright 50. 14) The Educational journey. 15) Calendar. Includes 29 photographs and illustrations. Gift from Kathryn Smith. Description: 1) Editor�s Word. 2) President�s Message. 3) Taliesin Next: Student Shelters. 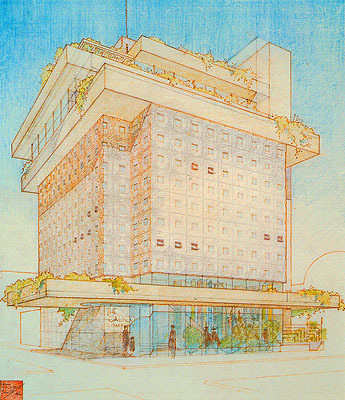 4) Wright�s last remaining hotel reborn. 5) Taliesin Fellows: The Early Years. 6) Preserving at Taliesin: Exploring Mrs. Wright�s bedroom and guest wing. 7) In Memoriam: Robert Beharka. 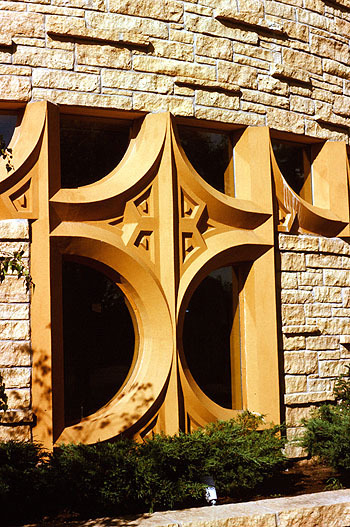 8) Prairie School Tradition Exhibition & Conference. 9) Chronicles: Winter 2010-11. 10) Voices. 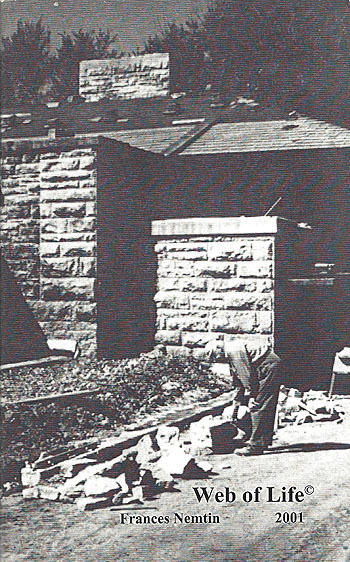 Abrom Dombar: Building at Taliesin, 1932-1935. 11) Calendar. Includes 62 photographs and illustrations. 8.5 x 8.5. Gift from Kathryn Smith. 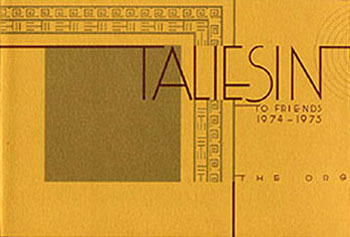 Description: Taliesin 1911-2011. 1) A Torch is Passed: A New Editor. 2) President�s Message. 3) Foundation CEO Message. 4) Dean�s Letter. 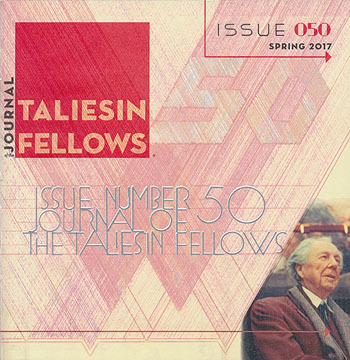 5) The Seed of Taliesin At 100. 6) A Spring Green View. 7) Reconnection with Old Friends. 8) In Search of an Organic Architecture. 9) Our Legacy: A Call To Action. 10) Centennial Talk at Milwaukee Art Museum: An Important Legacy to Study. 11) This Space Within. Kamal Amin. 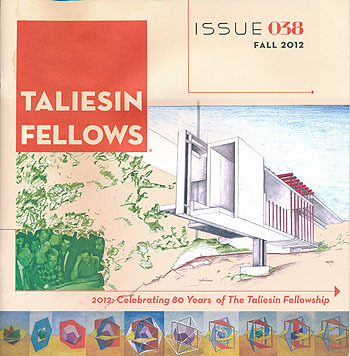 12) Taliesin Fellows Gallery. The Eckert Residence by R. Joseph Febris. 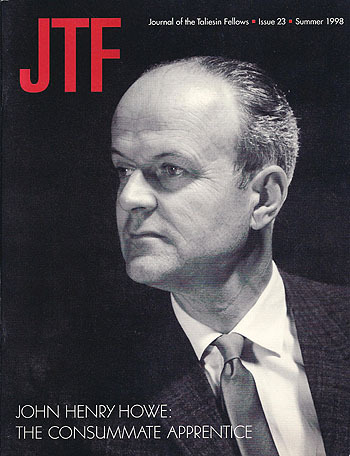 13) In Remembrance: James Dresser (1925 - 2011). 14) In Remembrance: Delton Ludwig (1934-2011). 15) In Remembrance: John Geiger (1921-2011). 16) In Remembrance: Edgar Tafel (1912-2011). 17) Noteworthy Books. 18) Noteworthy Media 19) Noteworthy Book. 20) Calendar. 21) Chronicles: Summer 2011. 22) Enjoying This? Become a Member! Includes 103 photographs and illustrations. Description: 1) Editor�s Word: Your moral circle. 2) Outgoing President�s Message. 3) Incoming President�s message. 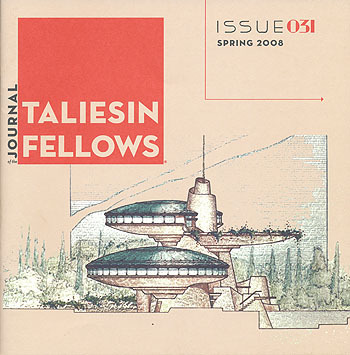 4) Taliesin Fellows Committees. Why Haiti? 5) Taliesin Fellows on the internet. 6) A Contained world of ornament (imperial Hotel). 7) Minding design. 8) Recent Apprentice Work: Pranav Naik. 9) Recent Apprentice Work: Max Borshchevskiy. 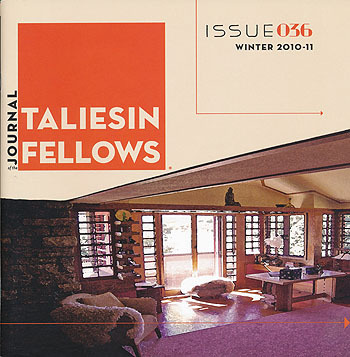 10) Taliesin Fellows Gallery. The Stein Residence by Alden B. Dow. Midland Michigan. 11) A Tribute: Lawrence R. Brink (1937-2011). 12) Excerpts from an Oral History with Larry Brink. 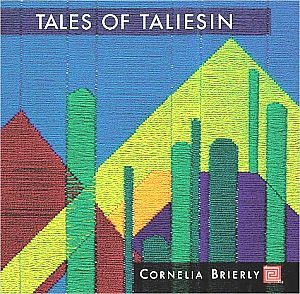 13) A Tribute: Cornella Brierly (1913 - 2012). 14) A Tribute: Pedro E. Guerrero (1917-1959). 15) Noteworthy Books. 16) Our work series, Help needed. 17) Chronicles: Spring 2012. Includes 85 photographs and illustrations. Gift from Kathryn Smith. Description: 1) JTF Editor�s message. 2) President�s Message. 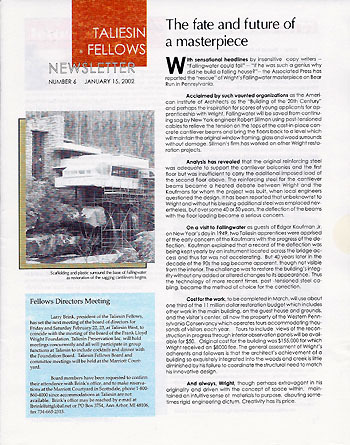 3) Frank Lloyd Wright Foundation CEO message. 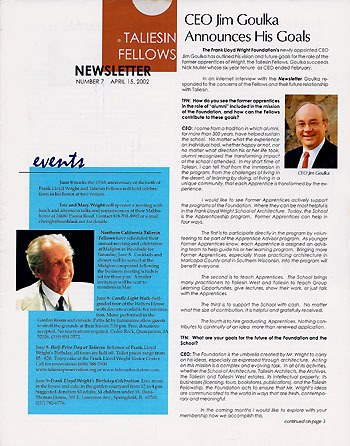 4) Dean�s message 5) Frank Lloyd Wright, The last of the founding fathers. 6) Surrounded by sculpture: The joy and value of organic architecture. 7) Designing the perfect gift - Taliesin apprentice box projects. 8) Morphohedron: Work of Stephen Wilmoth 9) History of the Taliesin Fellows. Part II: The next ten years: 2000 to 2010. 10) Noteworthy Books. 11) A philosophical summary of Organic Architecture. 12) Chronicles: Winter 2013. 13) David Wright House. 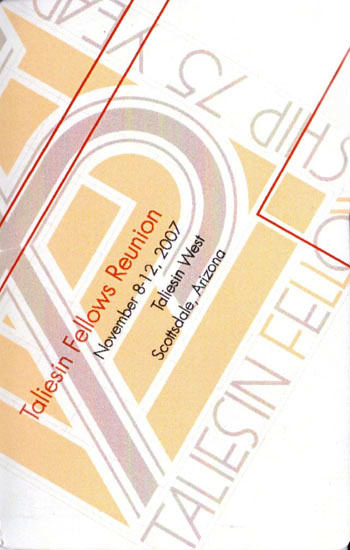 14) Taliesin Fellowship Reunion. Includes 65 photographs and illustrations. 8.5 x 8.5. Gift from Kathryn Smith. Description: 1) JTF Editor�s message. 2) President�s Message. 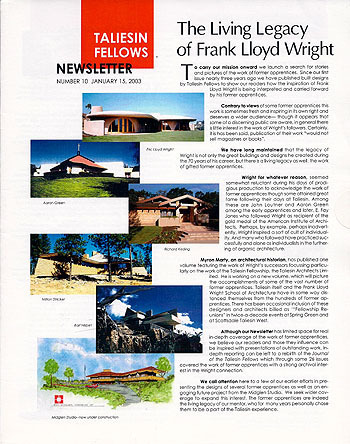 3) Frank Lloyd Wright Foundation CEO message. 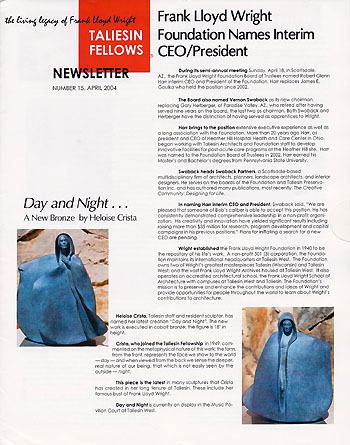 4) Dean�s message 5) Meet new Taliesin Fellows Board Members 6) Work of Mani and Radika Subra 7) Energizing Taliesin West. 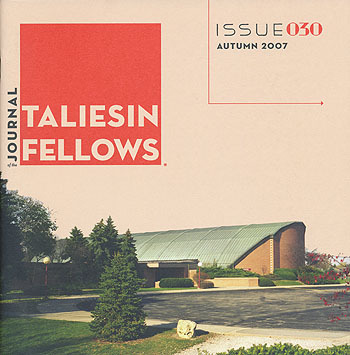 8) The Taliesin Education: From concept to the Present. 9) Wes and Taliesin West 10) Noteworthy Books. 11) In Memoriam, Maxine Pfefferkorn; Paolo Soleri; Dr. Joseph Rorke. Includes 71 photographs and illustrations. 8.5 x 8.5. Gift from Kathryn Smith. Description: 1) JTF Editor�s Message. 2) President�s Message. 3) The Creative Mind. 4) Work of Roy Seikichi Oshiro. 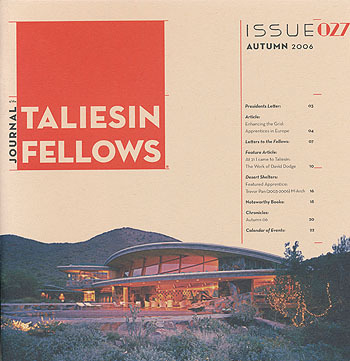 5) Recollections of Taliesin with Frank Lloyd Wright, 1951 - 1959. 6) Organic Graphics. An interview with Frank Lloyd Wright. 7) Development in the Valley of the Sun. 8) Under Construction. Part 1. Carlson Residence. 9) Part 2. Gettysburg Elementary School Remodeling. 10) In Memorial: Elizabeth Wright Ingraham. 11) In Memorial: Sarah Margaret Houston Logue. 12) In Memorial: Barbara Kaiser. 13) In Memorial: Frank Henry. 14) Noteworthy Book. Taliesin Diary. 15) Architectural Simplicity. 16) Quartet for Desert Moon. Gift from Kathryn Smith. Description: 1) JTF Editor�s Message. 2) President�s Message. 3) Letter from JTF Reader. 4) How Did Frank Lloyd Wright�s "Thought-Built" Architecture Become Green Building? 5) New Taliesin Board Members: Randolph C. Henning; Heublein, Michael; Clark, Chelsea. 6) Current Apprentice Box Projects: Irakiza, Edgar; Knox, Daniel; Moncayo, Pablo. 7) Frank Lloyd Wright and the Principles of Organic Architecture. 8) Work of John Lautner. 9) Under Construction. 10) Eco Villages, Sustainable Communities. 11) In Memorium. LaDon VanNay. 12) Downed. 13) In Search of Wright. 14) Noteworthy Journal. 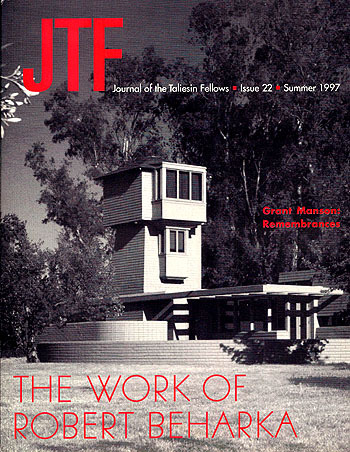 Journal of Organic Architecture. 15) Chronicles. 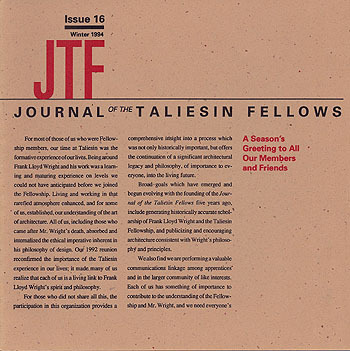 16) From the Taliesin Fellows Board of Directors. Gift from Kathryn Smith. Author: Editor: Thompson, Kimbal; 1 & 8) Scott, William Blair; 2) Thompson, Kimbal; 3) Betsky, Aaron; 4) Cordova, Mark-Thomas 5) Laraway, W. Frank; Devenney, Nick; 6) Lee, Jack P.; 7) O�Malley, Eric; 9) Lang, Casey; 10) Henning, Randolph C.; Bisharat, Leslie Lockhart. Description: 1) JTF Editor�s Message. 2) President�s Message. 3) Dean�s Message. 4) Student Work. 5) Letters To The JTF. 6) My Journey With Frank Lloyd Wright / Allen B Dow. 7) Frank Lloyd Wright in Michigan. 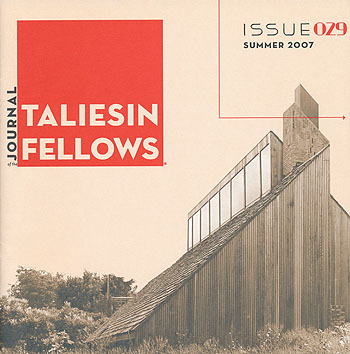 8) Work by the Taliesin Associated Architects in Michigan. 9) Taliesin West Kitchen. 10) In Memoriam: Robert Charles Broward; Frances Nemtin. Gift from Kathryn Smith. 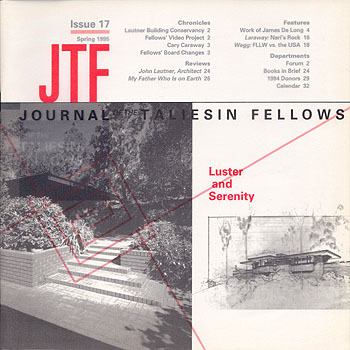 Description: 1) Editor�s Message 2) President�s Message 3) Dean�s Message 4) Organic Architecture in Florida, including Florida Southern College 5) The Interior Restoration of the Annie Pfeiffer Chapel at Florida Southern College 6) The Usonian House at FSC 7) George and Clifton Lewis Residence 8) Taliesin West - Summer 1958 9) Taliesin West Kitchen 10) In Memoriam, Iovanna Lloyd Wright 11) Noteworthy Book, Building the Usonian House. Includes 77 photographs of which we assisted by supplying two. Description: 1) JTF Editor�s Message. 2) Dean�s Message. 3) School Board Message. 4) President�s Message. 5) CEO Message. 6) Zach Rawling Appreciation, David & Gladys Wright House. 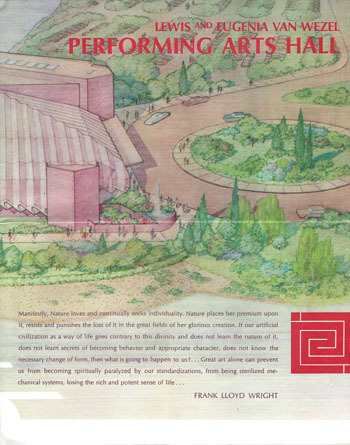 7) Introduction to Hawaii, Planning Architecture & Frank Lloyd Wright. 8) Martin Pence, 9) Architect Steve Oyakawa. 10) Kona Coast Hotel. 11) The Hawaii Collection; A Trilogy. 12) Noteworthy Books: "John H. Howe, Architect," Hession, Quigley; "Minnesota Modern: Architecture and Life at Midcentury," Millett. 13) Taliesin West Kitchen. 14) In Memoriam: Carl E. And Elaine Hedges Book. 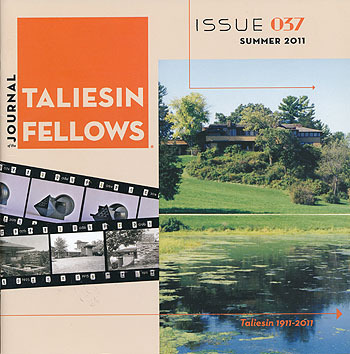 15) Taliesin Fellows. Membership, Directorship & Directions. Gift from Kathryn Smith. Author: Editor: Thompson, Kimbal; 1, 2, 11, 14; 3) Betsky, Aaron; 4) Graff, Stuart I.; 5) Lynn, Jacalyn; 6) Inostroza, Jaime; 7) Romano, Paul; 8) Dawsari, Elizabeth; Rattenbury, Kay; 9) Schuetz, Sue; 10) Berndtson, Indira; 12) Cunningham, Wallace; 14) Saffron, Inga. Description: 1) JTF Editor�s Message. 2) President�s Message. 3) Dean�s Message. 4) CEO Message. 5) School Board Message. 6) Jaime Inostroza. Frank Lloyd Wright School of Architecture. 7) Paul Romano. Frank Lloyd Wright School of Architecture. 8) History of "The Box." 9) Svetlana Wright Peters. 10) Kay Rattenbury and the A,D. German Family. 11) The Dressers. 12) Giovanni Del Prinicipi Del Drago. The Dragon - Myths & Legends. 13) In Memoriam: Henry Grattan Gill; Stephen Gegner. 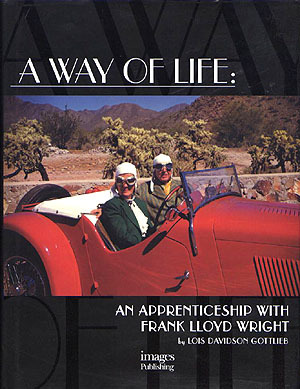 14) Noteworthy Books: "Architecture�s Odd Couple, Frank Lloyd Wright and Philip Johnson," Howard; "The Car is Architecture," Herink. Gift from Kathryn Smith. Description: 1) JTF Editor�s message. 2) President�s Message. 3) Dean�s message 4) CEO message. 5) School Board Message 6) Richard Quittenton, Frank Lloyd Wright School of Architecture. 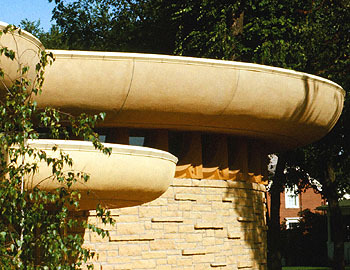 7) August Lietz, Frank Lloyd Wright School of Architecture. 8) It�s a (circle) not a (square). 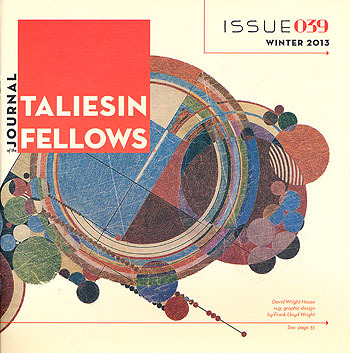 Whereever we go, we are among the circle of Taliesin Fellows. 9) Las Terrazas 10) In Memoriam: Frederick Liebhardt; Eloise Fritz; Joe Fabris, Gary Herberger Includes 90 photographs and illustrations. Gift from Kathryn Smith. 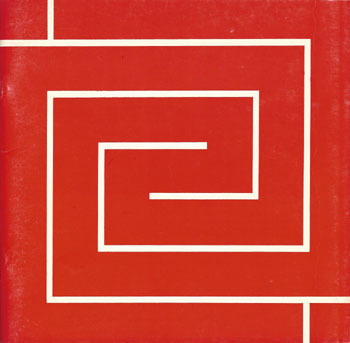 Author: Editor: O�Malley, Eric M. 1) Dyson, Arthur 2) O�Malley, Eric M. 3) Schuetz, Sue 4) Scott, William B. Jr. 5) Henning, Randolph C. 6) Spancer, Brian A. Description: 1) President�s Message. 2) Editor�s Message. 3) Celebrating The Peters-Margedant House. 4) In Memoriam: Carter Hugh Manny, Jr.; Anthony Puttnam. 5) Book Review: Shadow Patterns: Reflections on Fay Jones and His Architecture, Shannon, University of Arkansas Press, 2017; Wright Sites: A Guide to Frank Lloyd Wright Public Places, Fourth Edition, Hugland, Princeton Architectural Press, 2017. 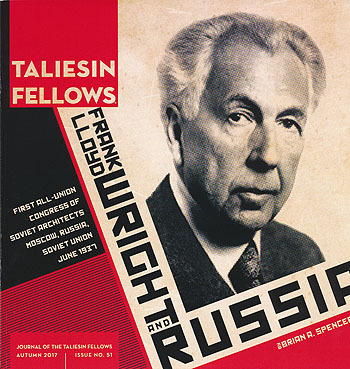 6) Frank Lloyd Wright and Russia. First all-union Congress of Soviet Architects. Moscow, Russia, Soviet Union - June 1937. Note: We supplied one photograph used in this issue. Included 41 photographs and illustrations. Description: 1) Taliesin Fellows Present the Newsletter. 2) NorCal Fellows Celebrate FLLW Birthday 3) A Taliesin Reflection 4) Bits and pieces... 5) The Studio of Eric Lloyd Wright 6) FLLW and Cyberspace 7) The Hanna Restoration 8) Organic Design Through the Abstraction of Nature 9) Frank Lloyd Wright in the Valley of the Sun 10) To the Loyal Defenders of Frank Lloyd Wright & Organic Architecture 11) The Origin of the Taliesin Fellows. Includes 11 photographs and eight illustration. Gift from Gerald Klitz. Description: 1) Wright�s Gordon House Saved by the Conservancy. 2) Bits and Pieces. 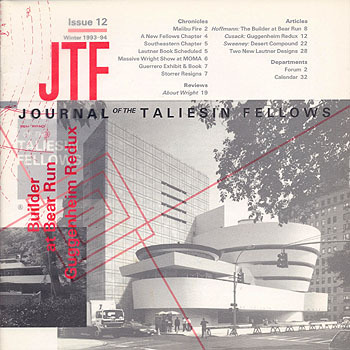 3) A Taliesin Memory 4) The FLLW Building Conservancy Meets in Minneapolis 5) Kebyar Meets in Chicago 6) Aaron Green designs a campus for North Carolina 7) The Origins of the Taliesin Fellows, Part 2. 8) Organic Design Through the Abstraction of Nature. Includes 14 photographs and 14 illustration. Original price $12.50. Gift from Gerald Klitz. Description: 1) Lautner�s Chemosphere gets new life. 2) Bits and Pieces. 3) Monaghan still has the Wright stuff. 4) In Passing, Yen Liang - 1908 - 2000. 5) Organic Design Through The Abstraction of Nature. Includes eight photographs and five illustration. Original price $12.50. Gift from Gerald Klitz. Description: 1) Taliesin Fellows Board Plans for 2001-2001. 2) In Passing, Donald Lovness. 3) Taliesin and the Future. 4) We will miss Aaron Green. 5) Aaron Green designs a campus for North Carolina. 6) Creating Architectural Pop Ups. 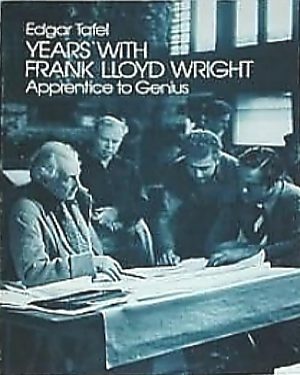 7) Frank Lloyd Wright and Bruce Goff - A Comparative Study. 8) Bruce Goff Architect: Architecture Education and Friends of Kebyar. 9) Book Review: "A Living Architecture". Includes 12 photographs and 16 illustration. Original price $12.50. Gift from Gerald Klitz. 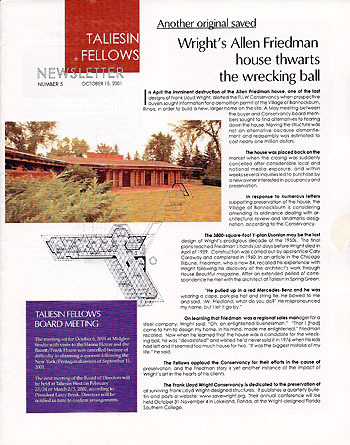 Description: 1) Wright�s Allen Friedman house thwarts the wrecking ball. 2) In Passing: Bradley Ray Storrer; Ray Brandes. 3) A Taliesin Reflection. 4) Organic Blkasphemies. 5) Wisconsin Wandering. 6) Organic Design Through The Abstraction of Nature. 7) CEO Nicholas Muller announces resignation. Includes 15 photographs and seven illustration. Original price $12.50. Gift from Gerald Klitz. Author: Editor: Patrick, William 2) Peterson, Barry 3) Keding, Richard A. 4) Cusack, Victor 5) Stricker, Milton 6) Brink, Lawrence R.
Description: 1) The fate and future of a masterpiece (Fallingwater). 2) Fossils, Faith, and Good Ideas. 3) Richard Keding and his Architecture. 4) Organic Architecture. 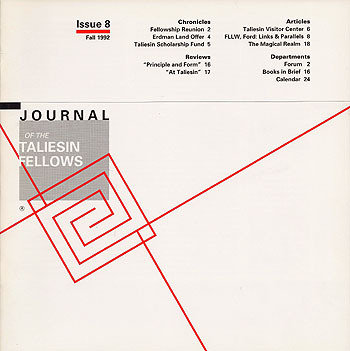 A current appraisal from the first decade of the Taliesin Fellowship. 5) Organic Design Through The Abstraction of Nature. 6) FLLW Conservancy meets at Florida Southern. Includes nine photographs and nine illustration. Original price $12.50. Gift from Gerald Klitz. Description: 1) CEO Jim Goulka Announces His Goals. 2) An unfortunate choice. 3) Bits and Pieces. 4) Earl Nisbet and His Architecture. 5) Book Review: "New Organic Architecture" by David Pearson. 6) Organic Design Through The Abstraction of Nature. 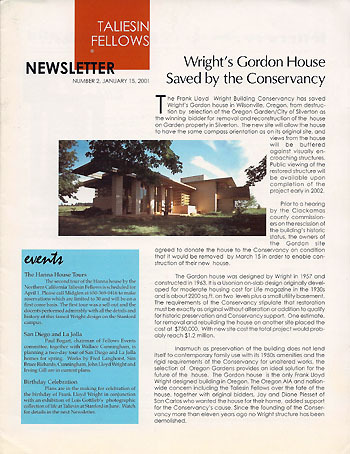 7) Wright�s Gordon House Relocated in Oregon Garden. Includes 19 photographs and 15 illustration. Original price $12.50. Gift from Gerald Klitz. 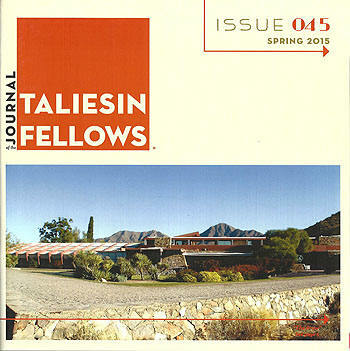 Description: 1) Taliesin to Celebrate 70 Fellowship Years. 2) In Passing, Jackson L. Wong. 3) The Future of Learning by Doing. 4) The Source of Art and Architecture. 5) Fellows Elect Three New Directors: Lee, Fletcher and Thompson. 6) The Hebrew Academy: Aaron Green Associates. 7) Bits and Pieces. Includes 21 photographs and 11 illustration. Original price $12.50. Gift from Gerald Klitz. 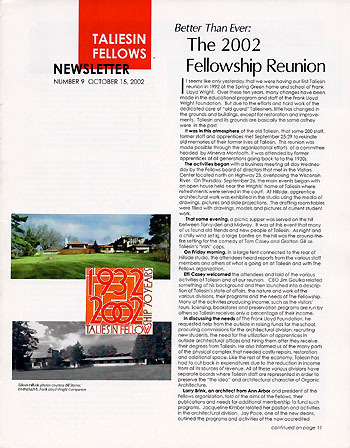 Description: 1) The 2002 Fellowship Reunion. 2) Nakoma is Built. Taliesin Architects Adapts Wright�s 1924 Design. 3) The Taliesin Landscape. 4) Waren Callister and His Architecture. 5) Another View (Imperial Hotel). 6) FLLW Versus the Bank of Phoenix. Includes 22 photographs and 5 illustration. Original price $12.50. Gift from Gerald Klitz. Description: 1) The Living Legacy of Frank Lloyd Wright. 2) FLLW versus Safeway. 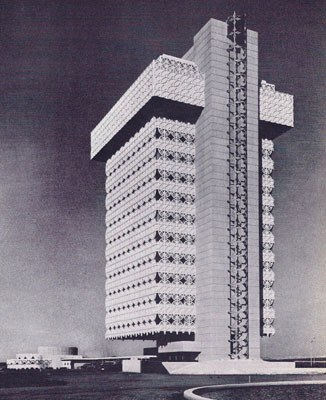 3) The Architecture of Kamal Amin. 4) The happy demise of another Gehry-mander. 5) In Passing, Mark Heyman. 6) Bilbao and Wisconsin. 7) The CEO Update. Includes 29 photographs and 8 illustration. Original price $12.50. Gift from Gerald Klitz. Description: 1) Ling Po Returns to Taliesin. 2) Recently Dwell Magazine of San Francisco... 3) The CEO Update. 4) The architecture of Jack Lee and the Successor of the Alden Dow office. 5) Architectural Schools in a Modern Technological World. 6) Ennis-Brown Rehabilitation. Includes 24 photographs and nine illustration. Original price $12.50. Gift from Gerald Klitz. Description: 1) Taliesin Architects Reorganized. 2) In Passing, Kaneji Domoto, 1913-2002. 3) Fellow Arthur Dyson Honored. 4) The Birthday Celebration. 5) Suzi�s View. 6) A Return to Organic Art. 7) The Final Resting Place. 8) Organic Design for Low(er)-cost housing. 9) This Year at Taliesin. Includes 21 photographs and 15 illustration. Original price $12.50. Gift from Gerald Klitz. Description: 1) The Wright Genie. 2) In Passing, Raku Endo, 1927-2003. J. Aubrey Banks, 1926-2003. 3) Book Reviews: "Fallingwater Rising. Uncommon Sense". 4) Review: "Fallingwater Rising". 5) The Midglen Studio and a Work in Progress. 6) A Return to Organic Architecture. 7) The CEO Update. 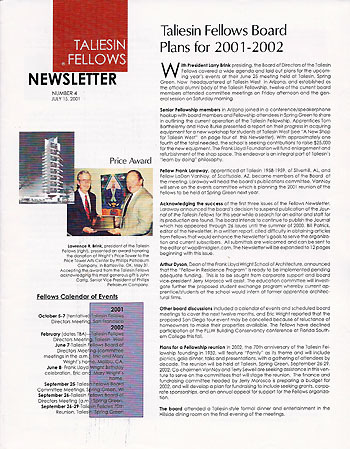 8) FLLW Building Conservancy Conference - 2003. Includes 27 photographs and Nine illustration. Original price $12.50. Gift from Gerald Klitz. Description: 1) The Curriculum at Taliesin. 2) In Passing. Isham R. McConnell, 1917-2003. James Palmer Lewis, 1918-2003. 3) The CEO Update. 4) The Final Resting Place. 5) The American Hebre Academy, North Carolina. 6) A Return to Organic Architecture. 7) James Scalise Named Taliesin Associate Dean. 8) Rook Reviews: "Wright-Sized Houses", "Frank Lloyd Wright A Bio-Bibliography", "Frank Lloyd Wright and the Johnson Wax Building". Includes 27 photographs and eight illustration. Original price $12.50. Gift from Gerald Klitz. Description: 1) Frank Lloyd Wright Foundation Names Interim CEO/President. 2) Day and Night. A new bronze by Heloise Crista. 3) In Passing. Robert Green, 1923-2003. 4) The Architecture of Arthur Kimbal Thompson. 5) The CEO Update. 6) Wright Foundation Ousts President; Both Sides Mum. 7) An Iranian Treasure. 8) Book Review. "Auldbrass". Includes 29 photographs and 10 illustration. Original price $12.50. Gift from Gerald Klitz. Description: 1) Taliesin Preservation Inc. Completes Restoration at Spring Green. 2) From the President�s Desk. 3) Passing. Richard P. Miller, 1931-2004. 4) Taliesin West Sets October Celebration. 5) The Architecture of H. Paterson Fletcher. 6) Reminiscence of Taliesin. 7) Arthur Dyson Designs. Fresno Woodward Park Regional Library. 8) Books Reviews. "Usonia, New York". "Wrightscapes". Includes 30 photographs and three illustration. Original price $12.50. Gift from Gerald Klitz. 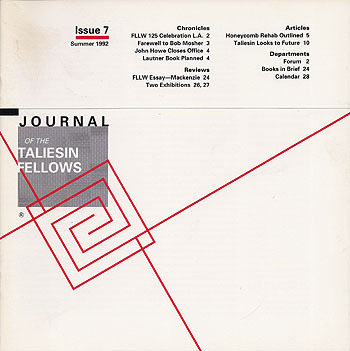 Description: 1) Taliesin Fellows� Gold Medalist Euine Fay Jones Dies. 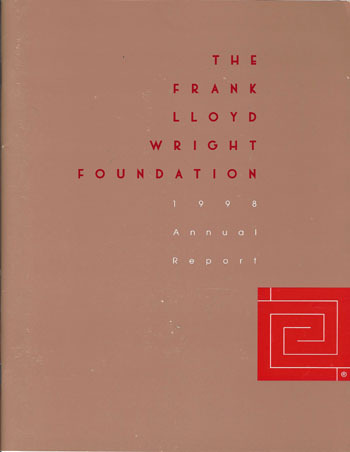 2) Frank Lloyd Wright Foundation Reports 2003 Activities. 3) Just making a buck. 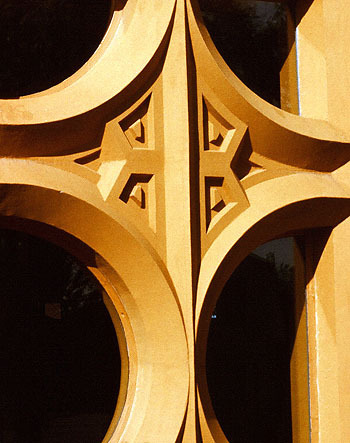 4) The Architecture of E. Fay Jones. 5) Reminiscence of Taliesin. 6) Books Reviews. 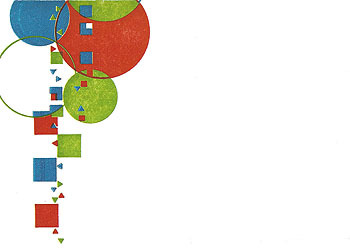 "Frank Lloyd Wright: The Interactive Portfolio". "Frank Lloyd Wright. 1867-1959: Building for Democracy". 7) Challenge and Opportunity. 8) Cornelia Brierly Receives Wright Spirit Award. Includes 23 photographs and 10 illustration. Original price $12.50. Gift from Gerald Klitz. 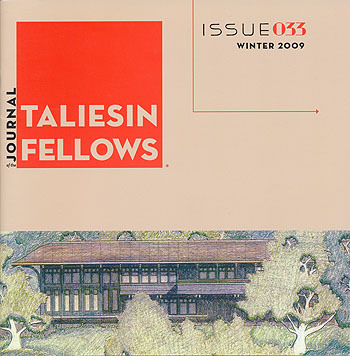 Description: "Taliesin. Yesterday, Today and Tomorrow. Long before Scottsdale was anything more than a crossroads town with a few stores, a bar, and a gas station or two, a bold new experiment in desert architecture was beginning to take shape at the base of the McDowell Mountains to the north. About 13 miles from the outskirts of town at the end of a dusty trail which wound its way upward along a dry wash, young men and women were busy building a complex of stone and concrete walls with fabric roofs unlike any structures ever before seen..." Includes eight photographs. Gift from Kathryn Smith.